Projekt se temelji na postojanju Bimodalnog oscilirajućeg sustava (BiOS – "Bimodal Oscillating System”), koji djeluje kao povratni mehanizam između Jadranskog i Jonskog mora i rezultira dekadnim promjena u cirkulaciji Sjevernojonskog vrtloga, čime utječe na advekciju ili Modificirane atlantske vode ili Levantinske / Istočnomediteranske vode u Jadran. Advekcija različitih vodenih masa u Jadran je potencijalno jedan od glavnih čimbenika koji utječe na jadranski ekosustav. Glavni mogući utjecaji BiOS-a na jadranski ekosustav su kroz: i) promjenu termohalinih svojstava i razliku gustoće između površinskih i dubokih slojeva južnog Jadrana, koji utječu na zimska konvektivna miješanja; ii) utjecaj na autotrofnu biomasu zbog promjena u koncentraciji nutrijenata; iii) donos različitih vrsta alohtonih organizama u Jadransko i Jonsko more. Cilj ovog projekta je utvrditi stupanj utjecaja advekcije različitih vodenih masa na ekosustav otvorenog južnog Jadrana, prvenstveno kroz praćenje promjena u planktonskim zajednicama, koje prve reagiraju na promjene u ekosustavu zbog kratkog životnog ciklusa i položaja u hranidbenom lancu. Također, primijenit ćemo filogeografske metode, koje podrazumijevaju uporabu jezgrinih i mitohondrijskih genetičkih markera, s ciljem utvrđivanja podrijetla stranih vrsta koje ulaze u Jadran te procjene utjecaja BIOS-a na genetički sastav jadranskih planktonskih populacija, donosom genetički različitih jedinki iz različitih dijelova Mediterana. Točni mehanizmi utjecaja ulaska vodenih masa na produkciju u Jadranu slabo su poznati. 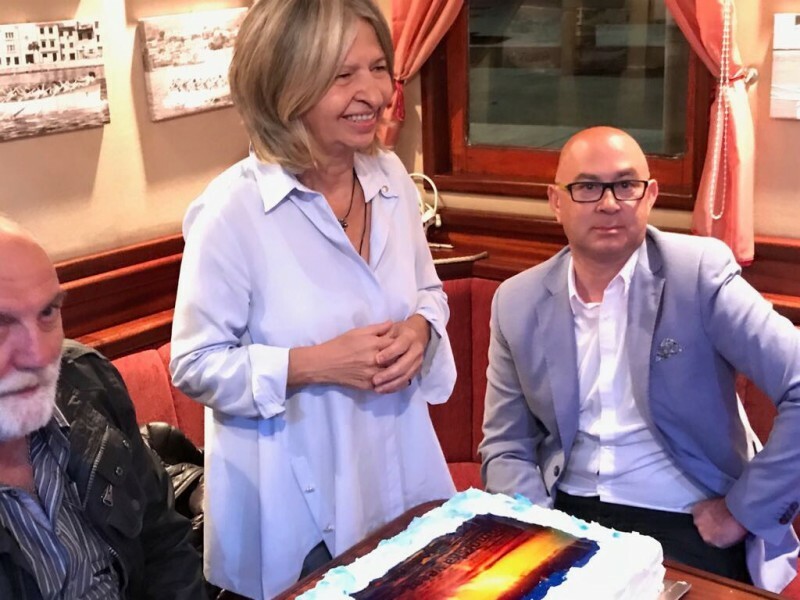 Njihovo razumijevanje omogućit će nam predviđanje ulova sitne plave ribe, što bi nam moglo poslužiti kao temelj za jedinstveno upravljanje i održivo ribarstvo kao važne grane hrvatskog gospodarstva. Taxonomy and ecology of marine zooplakton. 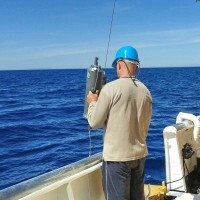 Oceanographic field work, use of basic and specific software programs for statistics, data archiving and processing. PhD in Biology (Botany), 1994. University of Zagreb, Faculty of Sciences, Division of Biology, Department of Botany, Zagreb, Croatia. MSc in Biology (Biology-Botany), 1987. University of Zagreb, Faculty of Sciences, Division of Biology, Department of Botany, Zagreb, Croatia. BSc in Biology, 1983. University of Sarajevo, Faculty of Sciences, Division of Biology, Department of Botany, Sarajevo, Bosnia and Herzegovina. Taxonomy and ecology of marine phytoplankton. 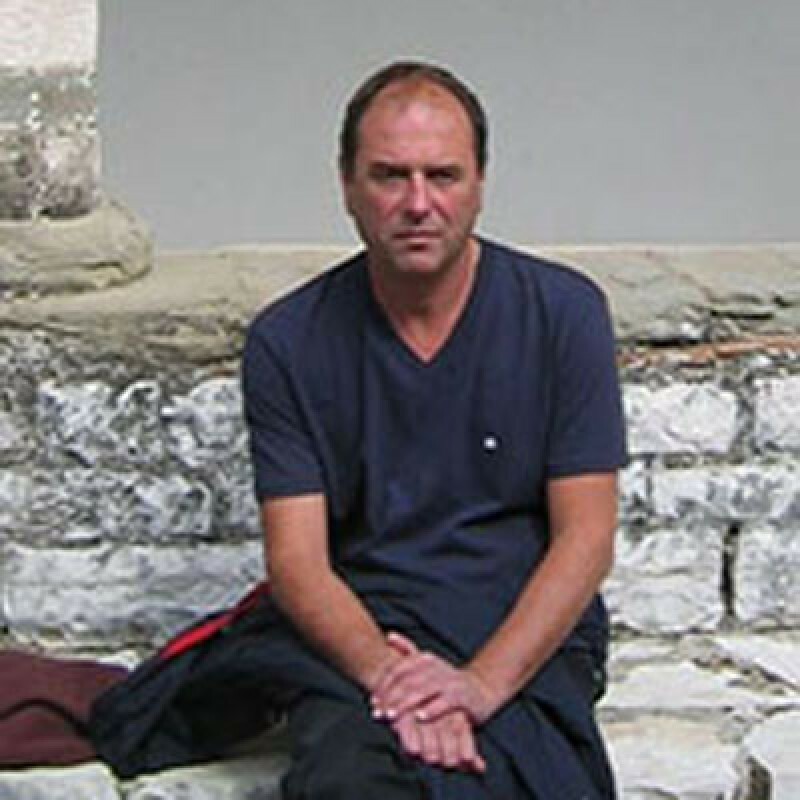 Founder and the first Head of Algological section of the Croatian Botanical Society (2010 – 2012). Vice-President of the Croatian Botanical Society (2006 – 2010). Member of the Nomenclature and Taxonomy Committee of the Croatian Botanical Society (since 2009 –). 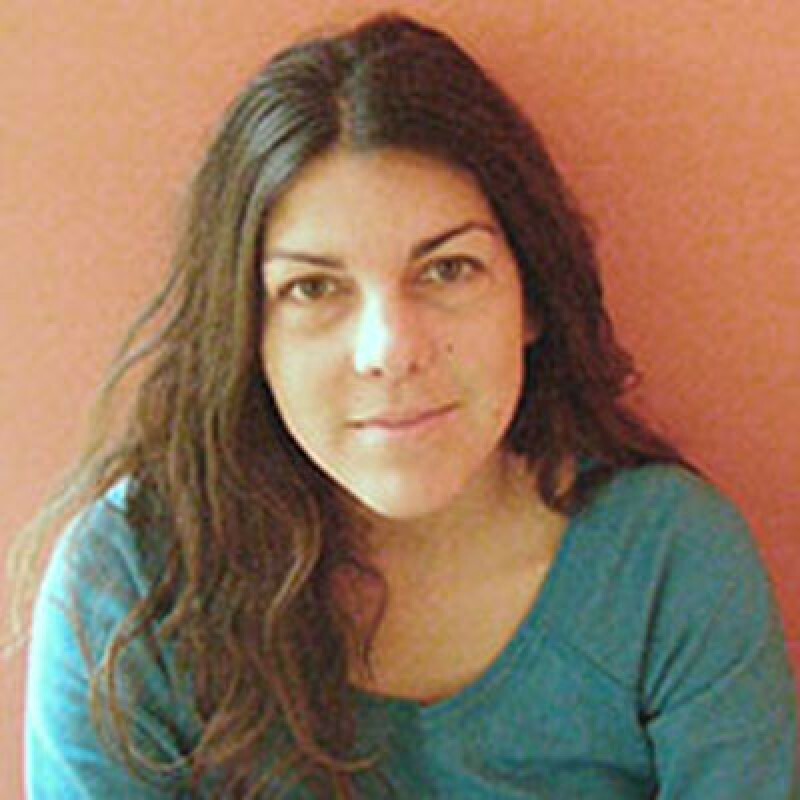 Editor of the Acta Botanica Croatica journal (since 2009 –). Member of Editorial board of the scientific journals: Drypis, Journal of Croatian Botanical Society, Naše more. 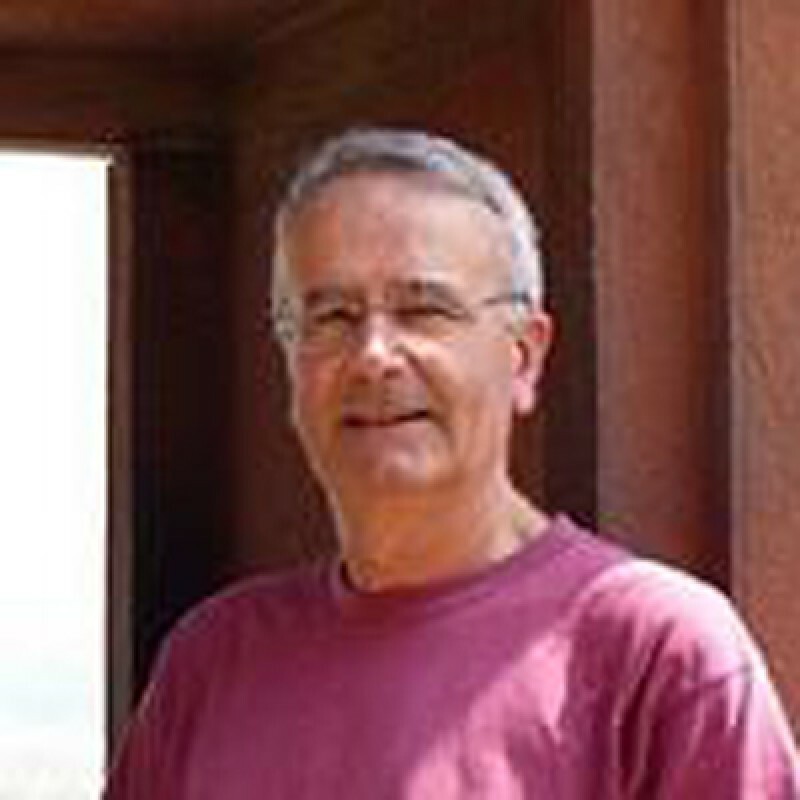 Council member of International Society for Diatom Research (ISDR) (2008 – 2010). 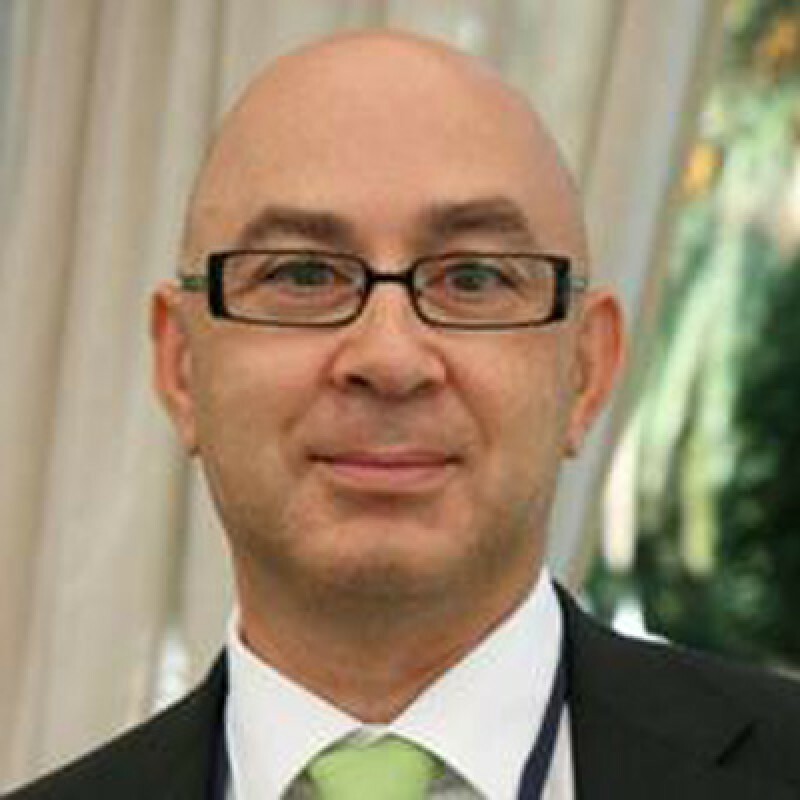 Council member of the Federation of European Phycological Societies (2010 – 2014). 1974: M.Sc., Physical Oceanography, University of Zagreb. 1970: B.Sc., Geophysics and Meteorology, University of Zagreb. Ocean circulation, dense water formation, strait exchange, coastal circulation, experimental oceanography, Mediterranean long-term variability. 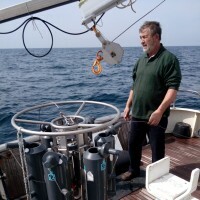 His research is principally devoted to the study of biogeochemical processes in the marine environment, in particular in the Mediterranean basin. His interests concern the study of some of the peculiarity of the Mediterranean, i. e. its altered N:P ratio, its oligotrophy, the mass and heat budgets through its straits, etc. 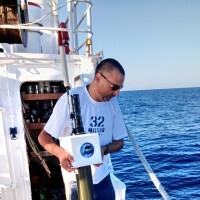 Recently, he has focussed his activity on the formalization of the mechanism called Adriatic-Ionian Bimodal Oscillating System (BiOS) driving the decadal variability of the Eastern Mediterranean thermohaline cell. 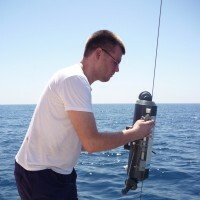 At present, his attention is focussed on the important implications of this mechanism on the biogeochemistry and biology of the Eastern Mediterranean. 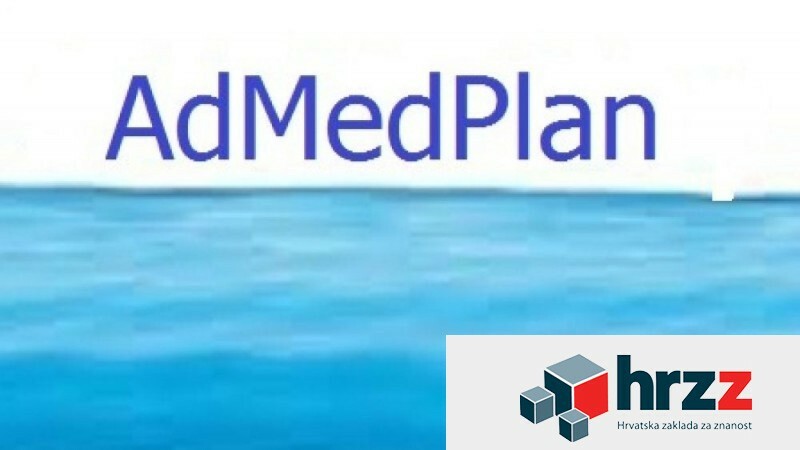 He is also involved on the assessment of pressure, knowledge and data gaps in Southern Europeas Sea in the frame of the Marine Strategy Framework Directive. University of Split, Faculty of Science, Department of Marine Studies, Interdisciplinary Doctoral Study in Applied Marine Science, PhD (2012); University of Zagreb, Faculty of Science, Division of Biology, Dipl. ing. Biology (1996-2002). 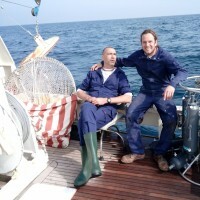 Working on board an oceanographic vessel and experience with basic oceanographic methods. Identification of zooplankton. Use of basic and specific software programs for statistics, data archiving and processing. University of Zagreb, Faculty of Science, Department of Biology, BSc of biology – ecology (2001), M.Sc. of biology (2009) and Ph.D of biology (2010). 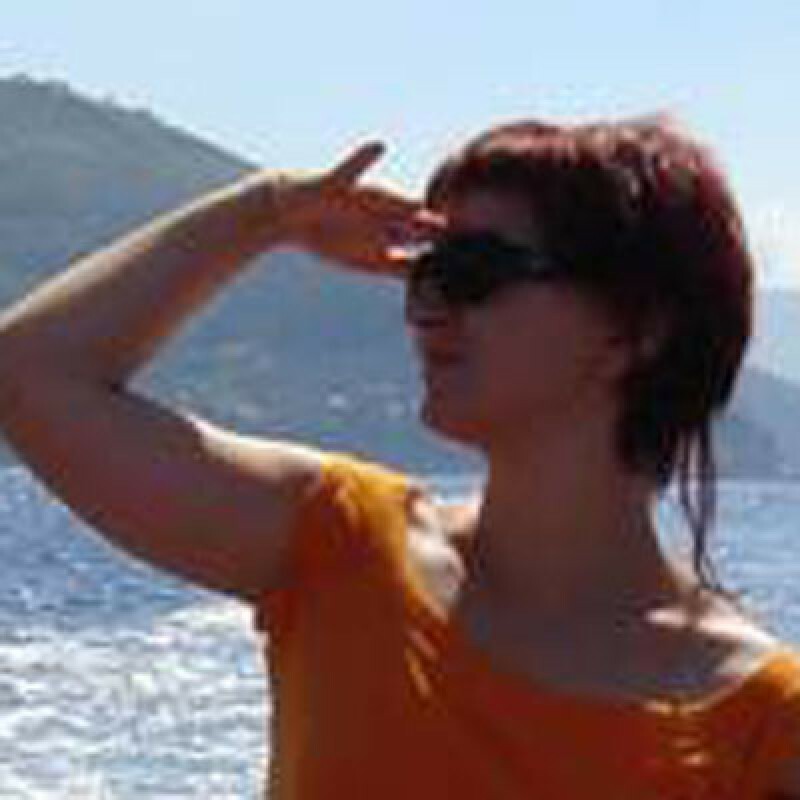 Institute for marine and costal research, University of Dubrovnik, Research assistant (2003-2010), Senior Teaching and Research Assistant (from 2011-). Taxonomy and ecology of marine phytoplankton, oceanography. 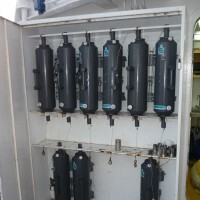 Oceanographic field work and laboratory techniques, work with microscope, taxonomical identification of marine phytoplankton, classical microbiological techniques, use of basic and specific software programs for statistics, data archiving and processing, one-star diver. Taxonomy and ecology of marine diatoms. Taxonomical identification of marine diatoms, isolation and culturing of diatoms, oceanographic field work, work with various types of microscopes, use of basic and specific software programs for statistics. 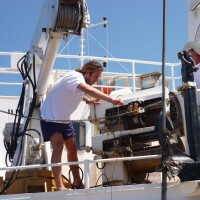 Research Associate (since 2004), Senior Research Assistant (1999–04), Research Assistant (1985-99) in the field of oceanology. 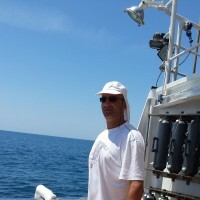 From May 1985 to December 2005 worked in Institute of Oceanography and Fisheries, and from January 2006 in University of Dubrovnik, Institute for Marine and Coastal Research. Coordinator of the EU/IPA project JASPPer (Joint Actions for Sea Pollution Prevention) in the period 2/2014 - 4/2015. Analysis of nutrients and shellfish biochemical composition; use of basic oceanographic methods, oceanographic field work; use of basic and specific software programs for statistics, data archiving and processing. 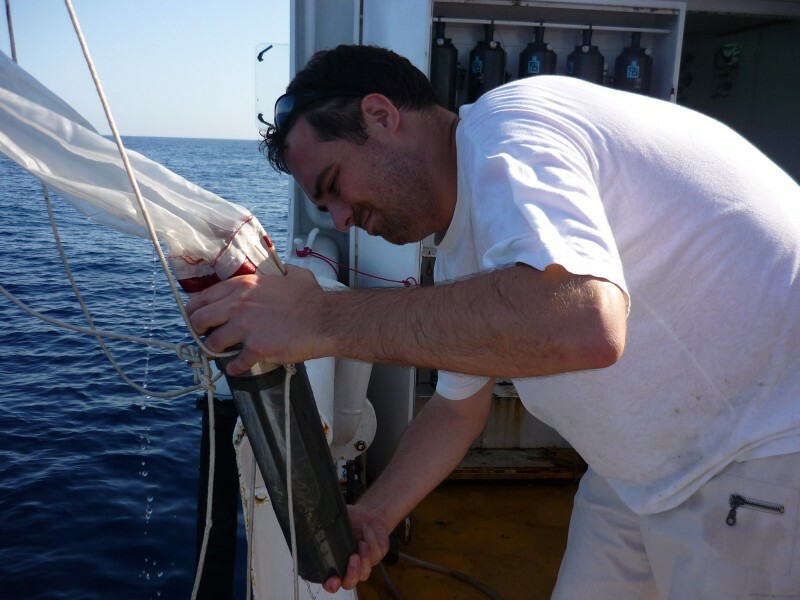 Taxonomical identification of marine zooplankton, DNA analysis, oceanographic field work. 1 September 2015 – 1 September 2016. "Festival znanosti” Natural History Museum, Dubrovnik, 18.4.2016. Mirna Batistić, Rade Garić, Davor Lučić, Mirjana Miloslavić and Nenad Jasprica have participated on the Round Table "Bioindicators of the situation and changes in the Adriatic Sea" which was held in Croatian Academy of Science and Arts in Zagreb, Croatia, on 7th December 2015. Mirna Batistić i Rade Garić had the presentation "Changes in the composition of gelatinous zooplankton in the Adriatic Sea in the last two decades", while Davor Lučić and Mirjana Miloslavić presented a lecture "Changes the composition and abundance of coastal zooplankton of the Adriatic Sea". Nenad Jasprica has attended at the Christians and Ecology meeting held on the 3rd and 4th October 2015 in Dubrovnik, where he has presented the purpose of the project. In the last two decades 21 species of non-crustacean zooplankton were observed for the first time in the South Adriatic, two species were recorded after years of absence, while four recorded species were new to science. Origin and the timing of the arrival of non-indigenous species tracked the changes in salinity in the South Adriatic driven by Bimodal Oscillating System (BiOS). According to recently postulated BiOS theory, the direction of the circulation of North Ionian Gyre (NIG) drives the inflow of different water masses into the Adriatic, which in turn modifies the Adriatic water outflow and reverses the circulation in the NIG. The occurrence of Atlantic/Western Mediterranean species coincided with the anti-cyclonic circulation in the NIG which brings Modified Atlantic Water into the Adriatic Sea, while the presence of Lessepsian species coincided with the cyclonic pattern in the NIG, which governs the entrance of Eastern Mediterranean waters. The impact of newcomers has translated into a larger contribution within the zooplankton community and, in particular cases, into the replacement of native species. The synergistic effects of these processes, together with warmer Mediterranean waters, raise concerns on dramatic changes in the marine biodiversity of the Adriatic Sea. Erasmus +Training in tunicate genome assembly and annotation. Cooperation with Professor Tron Frede Thingstad via two Erasmus+ training visits at University of Bergen, Norway in 2015 and 2016. 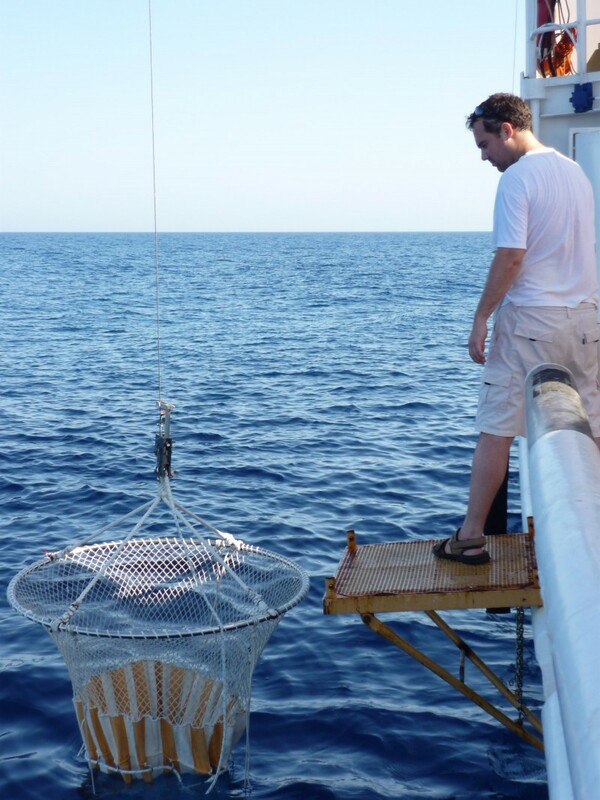 On top of that, Enis Hrustić has joined the mesocosm experiment at Crete, Greece in May 2016 due to invitation of Professor Thingstad and Professor Murat Van Ardelan (NTNU, Trondheim, Norway) within an EU-FP7 project Ocean-Certain.  He has performed along Professors Thingstad and Van Ardelan an original experiment concerning alkaline phosphatase activity and trace elements i.e. iron in the surface waters of Eastern Mediterranean. The results of cooperation with Professor Thingstad can be seen here (link on the article in Biogeosciences Discussions). Mirna Batistić was a guest in the radio show "Eco issues - Eco answers" on the Korčula radio-station on 25th August 2015 ( at 2:15 p.m.). M. Batistić has spoken about the investigations of the southern Adriatic Sea till now, and the planned research within the research project of the Croatian Science Foundation (HRZZ). Rade Garić was a guest in the shows of the Croatian Radio (December, 2015) regardng the new findings on morphology and phylogeny of the medusa Bougainvillia triestina. These were published in the scientific paper written by Mirna Batistić and Rade Garić in an international scientific journal Marine Ecology - an evolutionary prespective. On the Croatian public broadcasting company - Croatian RadioTelevision – within the show „More" (meaning „Sea") on the Channel 1 (February 11, 2016; on Sunday at 1.30 p.m.), it has been performed TV report by the journalist Ms Sanda Dičak about the discovering of the new meduase species in the Adriatic Sea. 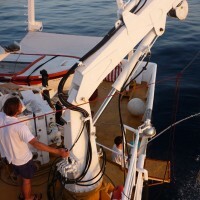 In the report, alongside the appearanceof the new species and newcomers in the Adriatic Sea, project's leader Mirna Batistić and collaborator Rade Garić have informed TV auditorium on the aims, duration and funding of the Croatian Science Foundation project (HRZZ, 2945) "Influence of thermohaline circulation variations in the Eastern Mediterranean on the plankton community of the South Adriatic: ecological and genetical approach (AdMedPLan)". 1 September 2016 – 1 September 2017. Mirna Batistić and Nenad Jasprica have participated on the Round Table held in the Croatian Academy of Science and Arts, Zagreb, on 24th November 2016 with topic : Investigation of the Adriatic Sea, Present and Future. Nenad Jasprica had presentation „Novelties in ecology of pelagial in the southern Adriatic". Within the presentation, some results originated from the HRZZ project have been presented. Organizers: Scientific Council for Adriatic Research of the the Croatian Academy of Science and Arts, and Scientific Council of the Ruđer Bošković Institute. Mirna Batistić and Nenad Jasprica have participated on the Annual Meeting of the Scientific Council for Adriatic Research of the Croatian Academy of Science and Art, Zagreb, on 2nd June 2017. Nenad Jasprica has presented, with co-authors Damir Viličić and Mirna Batistić, the work: „Phytoplankton and hydroclimatic changes in the south open Adriatic Sea (1993-2013)", i.e. subject which is part of the project. Batistić, M., Viličić, D., Kovačević, V., Jasprica, N., Lavigne, H., Carić, M., Garić, R., Car, A., 2017. Phytoplankton winter blooms in the offshore south Adriatic waters are regulated by hydroclimatic events in the period 1995-2012. Ursella, L., Cardin, V., Batistić, M., 2017. 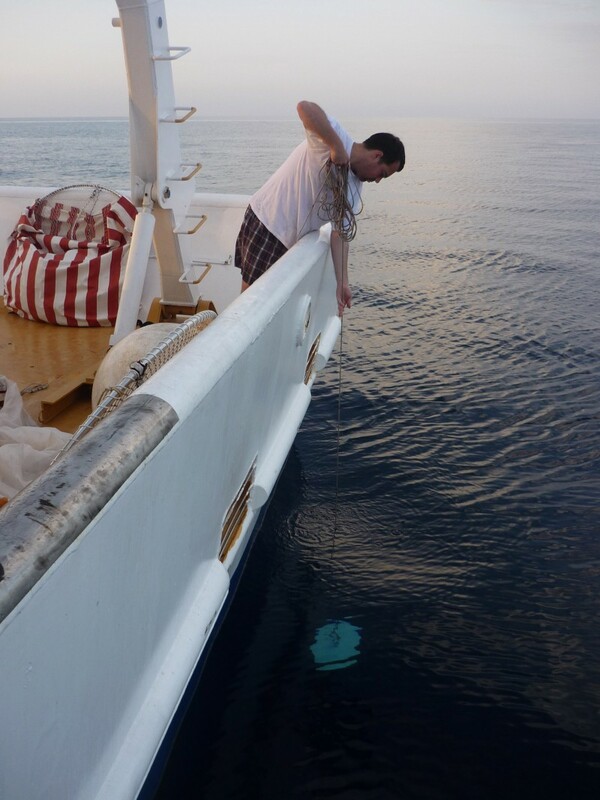 Evidence of zooplankton vertical migration from continuous Southern Adriatic buoy current-meter records (E2-M3A). Dupčić Radić I., Carić M., Hrustić E., Ljubimir S., Garić R., 2017, Long-term (1993-2016) variability of physical-chemical parameters in the South Adriatic under the different circulation regimes in the East Mediterranean. 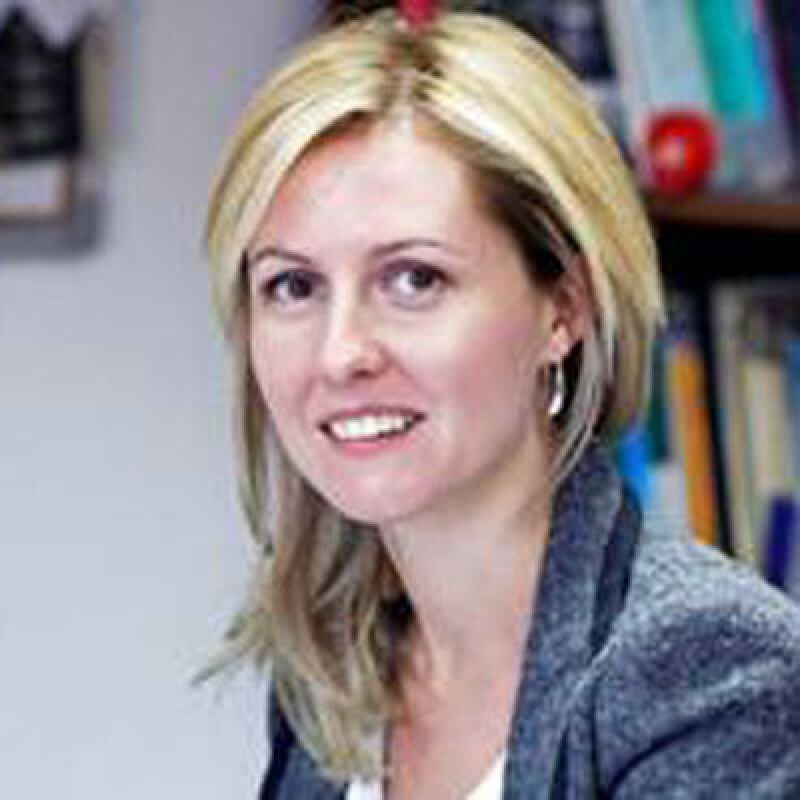 Batistić, M., Garić, R., 2016. Increase of planktonic Tunicata (Appendicularia, Thaliacea) biodiversity in the Adriatic Sea: A possible relationship with hydroclimatic changes in the Mediterranean Sea. Car, A., Witkowski, A., Jasprica, N., Ljubimir, S., Čalić, M., Dobosz, S. 2017. Comparison among epilithic diatom communities from areas of invasive Caulerpa species (Caulerpa taxifolia and Caulerpa cylindracea) in the Adriatic Sea (NE Mediterranean).Čalić, M., Car, A., Ljubimir, S., 2017. First records of the dinoflagellate of the genus Dicroerisma in the Adriatic Sea. Car, A., Hafner, D., Jasprica, N., Ljubimir, S., Dupčić Radić, I., 2016. Benthic diatoms of the small marine lake Mrtvo more (the island of Lokrum, Adriatic Sea). Car, A., Witkowski, A., Jasprica, N., 2016. Taxonomic composition of epiphytic diatoms from areas affected by invasive macroalgae Caulerpa taxifolia and Caulerpa cylindracea (Adriatic Sea, Croatia).Čalić, M., Ljubimir, S., Bosak, S., 2016. Unusual occurrence of tropical planktonic diatom species of the genus Chaetoceros in the South Adriatic.Garić, R., Batistić, M. 2016. First record of Fritillaria helenae in the Mediterranean Sea. 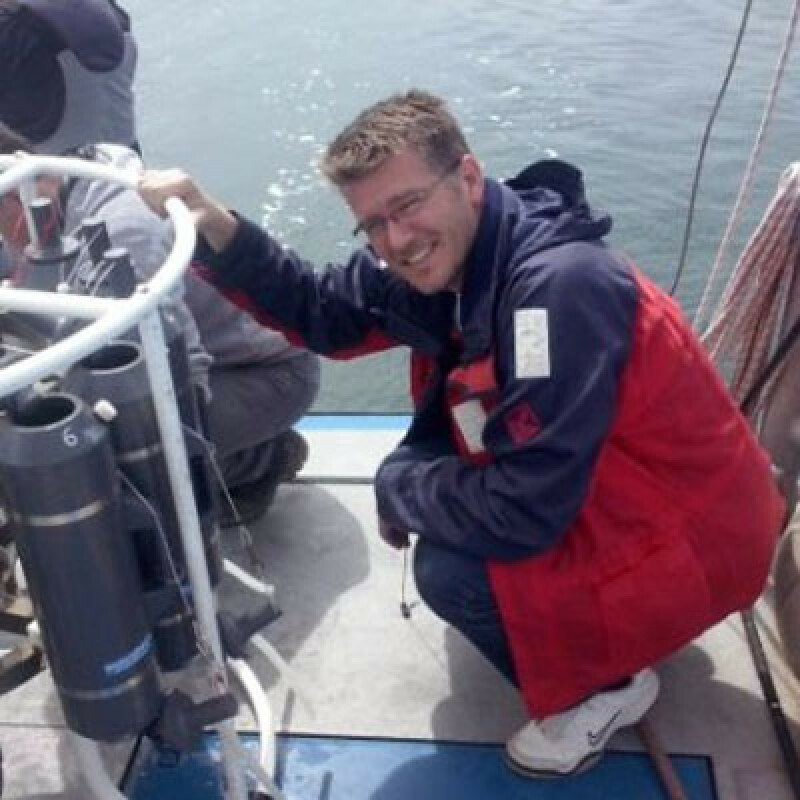 Enis Hrustić has attended at the workshop "Appearance and interaction of biologically important organic molecules and micronutrient metals in marine ecosystem under environmental stress (the project AMBIOMERES, IP-11-2013-8607, Dr Blaženka Gašparović, the leading scientist)” at Ruđer Bošković Institute in Zagreb on 19th September 2017. The title of the lecture was "Titration of the limiting nutrients in the sea using alkaline phosphatase activity”. Hrustić, E.: Cooperation with Professor Tron Frede Thingstad, University of Bergen, Norway via Erasmus+. Enis Hrustić was invited to perform an experiment in Trondheim, Norway. Two weeks (5-20th December 2016) work has extended the concepts started with Professor Tron Frede Thingstad via Erasmus+ in Bergen, Norway in 2015 and 2016 and at Crete, Greece via EU-FP7 project Ocean-Certain in May 2016. 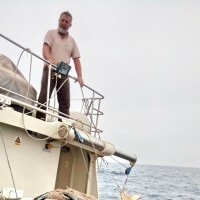 The third collaborator and the host in this operation was Professor Murat Van Ardelan at NTNU in Trondheim, Norway, who is an expert in marine chemistry and one of the leading researchers in the project Ocean-Certain. This team started work at Crete, Greece in May 2016. Although some improvements were achieved, the material is less likely to be published due to unclear results involving chemistry of iron. Jasprica, N., 2016. Organization of the 7th European Phycological Society in Zagreb, Croatia in 2019. Nenad Jasprica was a guest in the Croatian Radiotelevision (Croatian Radio – Radio Station Dubrovnik) „Broadcast for seafarers” (Hr: Emisija za pomorce: Moreplovi) on 24th November 2016 at 5:00 p.m., editor: Ms Božica Đurđević. Direct involvement (live) in the show from the city of Zagreb and the Round Table held in Croatian Academy of Sciences and Arts. Theme: Investigation of the Adriatic Sea, Present and Future. Nenad Jasprica has reported on the conclusions of the Round Table, including activities on the Croatian Science Foundation project (HRZZ, 2945, AdMedPLan).Nenad Jasprica was a guest in the Croatian radio (Croatian radio station Dubrovnik) in the one hour radio show format „Đirata-Tirada" (1st March 2017). Edito: Mr Boris Njavro and guest Dr Nenad Jasprica were talking about the investigations of the Adriatic Sea, project of the Croatian Science Foundation project (HRZZ, 2945): Influence of thermohaline circulation variations in the Eastern Mediterranean on the plankton community of the South Adriatic: ecological and genetical approach (AdMedPLan)", its goals and activities. Round Table held in the Croatian Academy of Science and Arts, Zagreb, on 24th November 2016. Annual Meeting of the Scientific Council for Adriatic Research of the Croatian Academy of Science and Art, Zagreb, on 2nd June 2017. Skype meeting of the Project members 2016/2017. 1 September 2017 – 1 September 2018. Čalić, Marijeta; Car, Ana; Ljubimir, Stijepo, 2017. First records of the dinoflagellate genus Dicroerisma in the Adriatic Sea. Phycologia, Congress Abstracts / Bąk, Małgorzata ; Dąbek, Przemysław ; Witkowski, Andrzej (eds.). Szczecin, Poland : International Phycological Society, Allen Press, Inc USA, 37–37. Several occurrences of planktonic dinoflagellate Dicroerisma psilonereiella (Gymnodiniales) were recorded during the long term study in South Adriatic open waters from 2010 to 2017. This taxon was recorded in 4 cases, mostly below 75 m and during winter- spring period. Abundance of D. psilonereiella in Adriatic did not exceed 102 cells L-1. Genus Dicroerisma has been described and reported primarily from the boreal and polar waters but nowadays it has been widespread in all the world oceans. Although it has been encountered in the Mediterranean those are the first findings in Adriatic Sea. 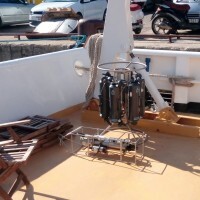 Recent investigations have shown that entering currents, of either Atlantic/Western Mediterranean or Eastern Mediterranean origin, modify the composition of the plankton community in the South Adriatic and each type of current brings different newcomers. Čalić, Marijeta; Dupčić Radić, Iris; Car, Ana, 2018. Effect of thermohaline circulation on diatom distribution in the open South Adriatic Sea. Congress abstracts of the 25th International diatom symposium/ Kusber, Wolf-Henning; Abarca, Nelida; Van, Anh Lina; Jahn Regine (eds). Botanic Garden and Botanical Museum Berlin, Freie Universitat Berlin, 30–30. Dynamics of a diatom community was studied during winter-spring period in span of two years that differed with respect to the oceanographic conditions induced by specific hydroclimatic events in southern Adriatic. 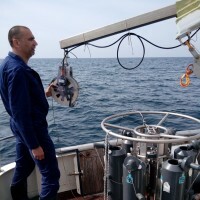 Sampling station was situated in the South Adriatic Pit (SAP) with depth of 1200 m. Altogether, 16 research cruises were undertaken and in total 232 bottle samples were observed for physical-chemical and phytoplankton analizes. Two specific phenomena were recorded in SAP during investigated periods: high abundances of diatoms in the aphotic zone associated with strong downward flow, and intense surface diatom bloom in 2017 induced by strong vertical convective mixing which increase nutrient availability in surface layer. Diatoms were the most diverse and abundant group of microphytoplankton (MICRO) during investigated periods, classified into 102 taxa of 48 genera. Contribution of diatoms in MICRO abundance ranged from 8.3 to 97.9% in 2016 and from 0.4 to 99.6% in 2017 with intense development and contribution during bloom in March 2017. At that time (3th and 20th of March) diatom abundances ranged from 6.1x102 to 5x104 cells L-1 and 2x102 to 1.9 x105 cells L- 1, respectively. In the begining of bloom (3th of March), intensive development of diatoms was recorded in surface layer (0-50 m). During the peak (20th of March) high abundances spread to 300 m. Four days later (24th of March), diatom abundance decreased in the surface layer and maintained in the reduced values in the deep samples (under 75 m). The diatom community during the winter-spring period was characterized by atypical mix of benthic, epilitic and planktonic species with Asterionellopsis glacialis (Castrac.) Round (2.4x104 cells L-1), Chaetoceros affinis Lauder (2.5 x104 cells L-1), Chaetoceros lorenzianus Grunow (2.3 x104 cells L-1), unidentified Chaetoceros Ehrenb. spp. (2.2 x 104 cells L-1), and Pseudo-nitzschia H. Perag. spp. (4.5 x104 cells L-1) as the most abundant taxa. The great contribution of coastal species at significant distance from the coast suggests the strong influence of different water masses in this area. Such a high abundances of diatoms, accompanied by a high concentration of chlorophyll a (>1 ?g L-1), indicated that area of SAP is not exclusively oligotrophic in the winter. Winter-early spring in the open water of South Adriatic could be considered as a productive season with significant phytoplankton activity. 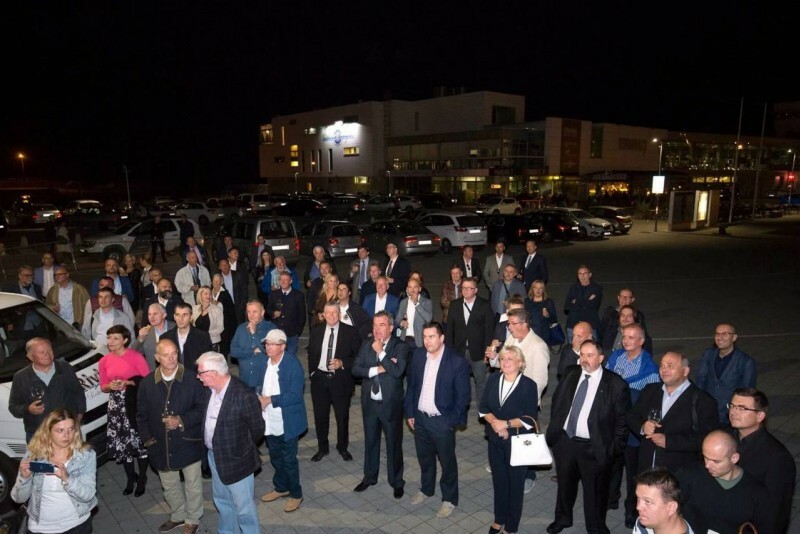 Car, Ana; Hafner, Dubravka; Jasprica, Nenad; Dupčić Radić, Iris; Ljubimir, Stijepo; Batistić, Mirna, 2018. The influence of environmental factors on diatom colonization on glass slides in the marine lake Mrtvo More (island of Lokrum, Adriatic Sea coast) // Abstracts of the 25th International Diatom Symposium / Kusber, W.-H. ; Abarca, N. ; Van, A. L. ; Jahn, R. (eds.). Berlin : Botanic Garden and Botanical Museum Berlin, Freie Universität Berlin. 31–31. In this study we investigated diatom colonization during period of first 6 months of artificial substrate (glass slides) exposure. From April to October 2016 microscopic glasses were submerged in the marine lake Mrtvo more (island of Lokrum, Dubrovnik area, South Adriatic, NE Mediterranean, Croatia). This semi-closed shallow marine ecosystem is connected with the open sea by an underwater passage, and is during summer season under significant anthropogenic influence (swimmers). The parallel oriented glass slides (against the surface) were placed on a seafloor at 1 m beneath the water surface. 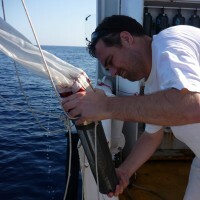 The samples were collected weekly. For light microscopy (LM) observations diatom frustules were cleaned from the organic material using method with hydrogen peroxide and hydrochloric acid. 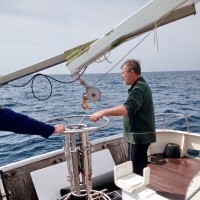 In order to determine the relationships between diatom community and environmental variables, water samples for analysis of physicochemical variables were taken weekly from the same place where diatom sampling was carried out. 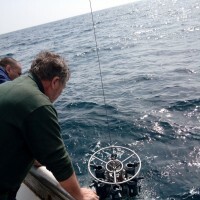 Water temperature ranged from 18.3°C (May) to 27.3°C (July). Salinity varied from 26.6 (October) to 37 (August). Oxygen saturation (O2/O2′) ranged 0.58 (September) to 1.3 (June). TIN ranged from 0.96 (May) to 10.2 (September) µM. Phosphate (PO4) ranged from 0.112 (May) to 0.578 (July). Silicate (SiO4) ranged from 3.925 (May) to 13.016 (July) µM. The benthic diatom flora was investigated and diversity was determined in relation to the concentrations of phosphate, silicate, and nitrogen compounds. The composition (% relative abundance) of a total of 133 diatom taxa within 47 genera found in the benthic diatom community of studied artificial substrates were identified in 21 samples. Species Cocconeis scutellum var. scutellum, Cocconeis dirupta var. flexella, Pinnularia sp., Diploneis crabro, Navicula salinicola, and Licmophora paradoxa were the most abundant. Genera with the greatest number of taxa were: Nitzschia (20 taxa), Mastogloia(11), Amphora (9) and Cocconeis (9). Altogether, only three taxa were presented in more than 85% of samples: Cocconeis scutellum var. scutellum,Cocconeis dirupta var. flexella and Cocconeis pseudomarginata. In total, 60 taxa were found only once (sporadic) with average relative abundances lower than 1.3%. The number of taxa per sample ranged from 9 (May, June) to 52 (August), with an average of 25.4. The species diversity index varied from 0.74 to 4.51. Pielou’s species evenness ranged from 0.23 to 0.86 (the average 0.63).The amount of biofilm increased through study period. Diatom assemblages were significantly different (ANOSIM, P<0.05) between the beginning samples till July and samples afterwards. Throughout the period from end of July till end of September, the community was characterized by a stable composition and high species diversity (Shannon-Weaver, mean H’=4.22). Different environmental conditions such as sea temperature, salinity, oxygen saturation and nutrient concentrations may have influenced unequal colonization between months. This study indicates that the early diatom biofilm formation and composition are affected by different environmental conditions. Additionally, it clarifies what parameters contribute to observed differences between months. The species composition of benthic diatom communities probably responds to environmental change and every different set of nutrient concentrations is characterized by a different diatom community. Batistić, Mirna; Garić, Rade, 2017. Bloom of Tunicata Pegea bicaudata in the open south Adriatic in June 2016 // Abstract Book - 52nd European Marine Biology Symposium / Ramšak, Andreja ; Francé, Janja ; Orlando-Bonaca, Martina ; Turk, Valentina ; Flander-Putrle, Vesna ; Mozetič, Patricija ; Lipej, Lovrenc ; Tinta, Tinkara ; Trkov, Domen ; Turk Dermastia, Timotej ; Malej, Alenka (eds.). Piran : National Institute of Biology, Marine Biology Station Piran, 118-118. Pegea bicaudata, cosmopolitan species, known from the west Mediterranean, was recorded for the first time in the Adriatic Sea in June 2016 at the open waters. Bloom with maximum of 2.6 blastozooids/m3 was recorded in the layer 50-100 m at the beginning of June. This bloom happened after spring phytoplankton maximum at the open South Adriatic. Increasing of the records of newly recorded planktonic tunicata species in the Adriatic Sea in the last two decades contributed to the higher marine biodiversity of the Adriatic Sea and could be in a connection with hydroclimatic changes in the Mediterranean Sea. Doliopsis rubescenswas a very common species in the Mediterranean in 19 th and in the beginning of the 20 th century. In the past it was a very abundant species, so much that it formed large blooms at the coast of France. Afterwards it has become extremely rare with sporadic records in the Atlantic. D. rubescens was found in the Adriatic for the first time in 2016 and 2017, in the depth layer from 50 to 200 m. Two individuals preserved in ethanol were sequenced and the phylogenetic tree was constructed based on 18S rRNA gene sequence. The phylogenetic position of D. rubescens is discussed in relation to other Thaliacea and its morphological peculiarities. Krzywda, Marta; Kaleli, Aydın; Solak, Cüneyt; Bosak, Suncica; Car, Ana; Jasprica, Nenad; Witkowski, Andrzej, 2018. The influence of sea turtles on the biogeography of marine diatoms based on a case study from the Mediterranean coasts // Abstracts of the 25th International Diatom Symposium / Kusber, W.-H. ; Abarca, N. ; Van, A. L. ; Jahn, R. (eds.). Berlin : Botanic Garden and Botanical Museum Berlin, Freie Universität Berlin, 88-88. Marine turtles are known to be hosts of diverse groups of organisms (epibionts), both plants and animals, particularly on their carapaces. Many of these epibionts attach to a variety of substrates in habitats where sea turtles spend time between nesting events or while foraging; however, a small group of taxa are limited in their distribution solely to the marine animals. The association between diatoms and turtles potentially exemplifies how epibiont data can be used to identify and corroborate patterns of turtle habitat use and movement. It is expected that vertebrates in general and marine turtles in particular play an important role in the dispersal of benthic diatoms, and could be significant contributors to the spread of invasive species. By studying diatom assemblages living on turtles, we expect to gain information about the role that turtles play in the dispersal of diatoms. We expect that benthic diatoms hosted by marine vertebrates will be characterized by a high degree of specialization, similar to other epibiont communities. In this study we have combined the analysis of species composition of diatoms incorporated into the biofilm formed on the carapaces of sea turtles with isolation and culture experiments. The diatom assemblages targeted inhabit the carapaces of loggerheads (Caretta caretta) and green turtles (Chelonia mydas) from the Mediterranean coasts in Turkey and Croatia. Altogether, several sampling seasons in the Aegean Sea in Turkey and one season in Croatia allowed us to isolate and successfully grow in culture ca. 120 strains. These include small Navicula, Nitzschia, Diploneis and Halamphora species, apparently incorporated into the carapace biofilm. Interestingly, stalk-forming species ofAchnanthes ss and tube-dwelling Parlibellus were included among these epibionts, and grew well in culture. These species in particular may provide an insight into the role of sea turtles in diatom distribution. This will be tested determining the species composition from cleaned and processed samples as well as with molecular analysis of the isolated strains. Extraction of DNA from cultured strains and use of molecular markers (rbcL, psbC and SSU) was applied in testing the hypothesis that the diatoms present on turtle carapaces will exhibit biogeography and possess geographic ranges that match those of their hosts. Additionally, recent results based on species composition analysis solely suggest that the same epibiontic diatom species can be found on the loggerhead turtles and, for example, green turtles from the distant geographic regions e.g. Mediterranean and the Caribbean Sea. Lučić, Davor; Ljubešić, Zrinka; Babić, Ivana; Bosak, Sunčica; Cetinić, Ivona; Vilibić, Ivica; Mihanović, Hrvoje; Hure, Marijana; Njire, Jakica; Lučić, Petra; Kružić, Petar, 2017. Unusual zooplankton bloom in the open southern Adriatic Sea // Abstract Book - 52nd European Marine Biology Symposium / Ramšak, Andreja ; Francé, Janja ; Orlando-Bonaca, Martina ; Turk, Valentina ; Flander-Putrle, Vesna ; Mozetič, Patricija ; Lipej, Lovrenc ; Tinta, Tinkara ; Trkov, Domen ; Turk Dermastia, Timotej ; Malej, Alenka (eds.). Piran : National Institute of Biology, Marine Biology Station Piran, 160-160. The paper reports an unusual response of the microzooplankton community to oceanographic conditions observed during the winter of 2015 at the open South Adriatic. Record-breaking nauplii abundance of 13 734 ind. 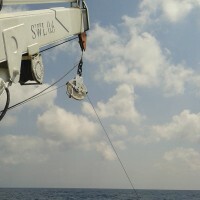 m-3 have been sampled for the open South Adriatic by 50 - μm net sampling. 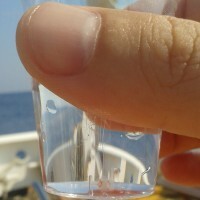 High densities were noted up to the 300 m depth for all copepods developmental stages The observed zooplankton maximum could have been ascribed to (i) warmer-than-usual surface and intermediate ocean temperatures, (ii) a high excess in precipitation preceding the samplings for a prolonged period, which freshened and widened surface layers and pushed saline Levantine Intermediate Water inflow below 400 m depth, and (iii) strong wind episodes that could transfer nutrients from coastal area to open ocean and induce limited vertical convention. The latter has been confirmed by observing neritic tintinnids species exclusively in the mesopelagic layer and autotrophic cells below the photic zone. Average seasonal maximum of zooplankton abundance is shifted from spring and early summer towards late winter months. 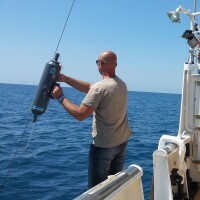 Our results are documenting large and fast variations of production conditions, rarely found to occur in oligotrophic waters such as the South Adriatic Sea. The Adriatic Sea is a semi-enclosed sea and its ecosystem is influenced by the regular exchange of water with the Eastern Mediterranean. Levantine Intermediate Water and Ionian Surface Water flow into the Adriatic along the sea’s eastern border. The volume of this flow depends on climatic oscillations that occur from the Atlantic to the Southeast Mediterranean. The South Adriatic, the deepest part of the Adriatic Sea, represents a key area for both the Adriatic Sea itself and the entire Eastern Mediterranean basin. Tintinnids are the best known ciliates in the marine plankton. Their high frequencies and identifiable morphology have been suggested as indicators of oceanographic conditions including water temperature and origin, such as neritic, oceanic, and even upwelling water. 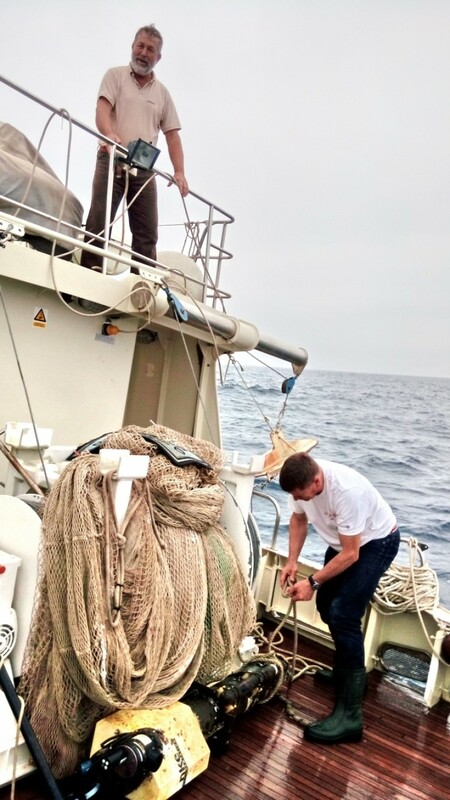 Samples in South Adriatic were collected at four stations with a 53 µm mesh Nansen net. The spatial and temporal distribution of tintinnids was investigated at monthly intervals in the South Adriatic Sea during 2016. Of the 68 species identified, there were 47 surface, 15 subsurface, 3 mid-water, and 1 deep sea species. The dominant surface and subsurface species were Codonella aspera, Codonella amphorella, Undella claparedei and Salpingella accuminata. Species Parundella lohmanni predominated in the mid-water layers and Xystonellopsis scyphium in the deep-sea layers. 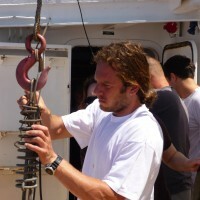 While the majority species are always present in the South Adriatic Sea, some species were occasionally immigrates from the Mediterranean Sea. The highest variability in the number of species occurred in the surface and subsurface layers. A mid-water community of speciesParundella lohmanii indicated inflowing South Adriatic Deep Water. Some other species such as Poroceus apiculatus, Undella subcaudata and Eutintinnus elegans appeared with strong inflows of the Levantine Intermediate Water during winter and spring. Based on these results, tintinnids may be used as a biological indicator of the state or possible changes in the marine ecosystems of the South Adriatic Sea. Special show of the Croatian Radio due to celebrating of the 65th anniversary of the broadcast Pomorska Večer. 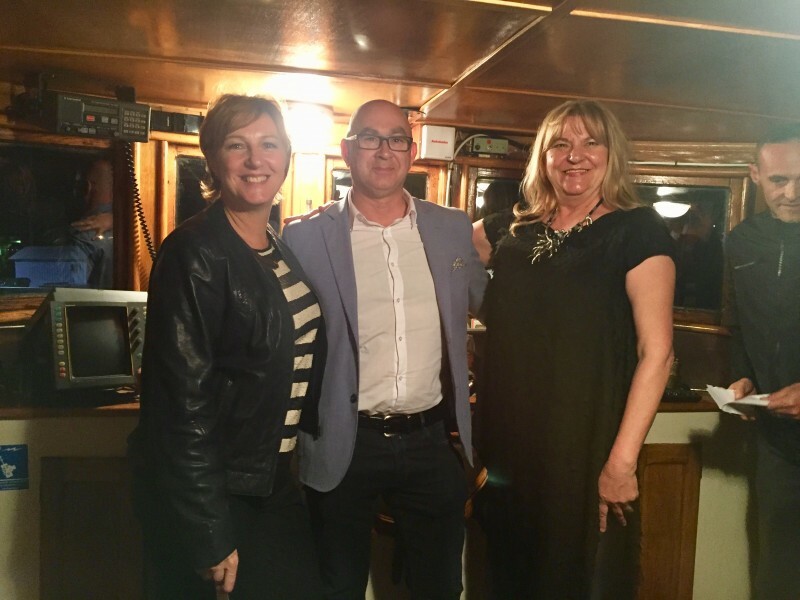 In interview (live from the schoolboat "Villa Velebita 2” in the port of the city of Rijeka on October 2, 2017) with editor Mrs. Dorina Tikvicki (Radio-Pula), guest Nenad Jasprica also represented the activities on this project. Invazija stvorenja slična meduzama u moru kod Istre i Kvarnera. Prave meduze u našem moru. Pokraj plaže u Baćini otkriven opasni predator. U pločanskom akvatoriju uočen opasni rebraš! Jadranom se širi opasan predator koji je uništio Crno more. Nova invazivna vrsta u Jadranu: Rebraš prijeti ribljem fondu. Biolog svjetskog glasa. Planktonska ljubav Rade Garića. 1 September 2018 – 1 September 2019. 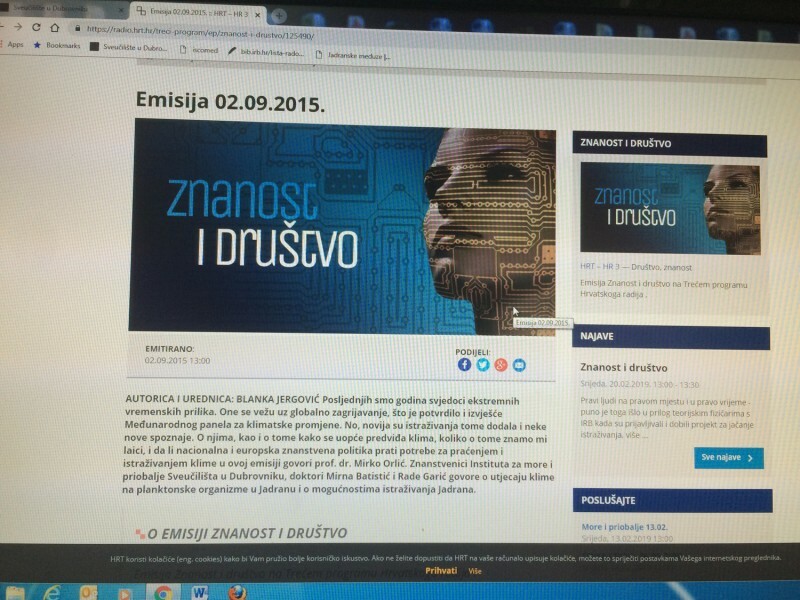 Znanost i društvo, HRT-Hrvatski radio, 13. February 2019. The monogeneric family Mesaiokeratidae (Copepoda: Calanoida) is exclusively bentho-pelagic and comprises nine small hyperbenthic species. Previous knowledge of these species has been limited to the description of their morphology and habitat. We provide new information about the ecology of Mesaiokeras hurei Kršinić, 2003, one of the small-size species of the family and found only in an isolated marine lake on the southern Adriatic island of Mljet (Croatia). Genetic markers were used to investigate its phylogenetic relationships with other copepods. The abundance of M. hurei was highly variable over the years and seasons sampled. Densities were higher in spring and autumn. It was particularly abundant in 2011, averaging 629 ± 800 individuals/m3, and with a maximum of 1971 individuals m−3 in November, but averaged 74 ± 71 individuals/m3 and 66 ± 71 individuals/m3 in 2001 and 2008, respectively. Specimens were found in a range of temperatures, from 10.5°C to 18.3°C, but a majority of individuals (67%) was found in the 12-14°C layer. In addition to temperature, oxygen was a significant predictor (p < 0.001) of the vertical micro-distribution of M. hurei. The DNA barcode sequence for the species is reported here for the first time. Analysis of the nuclear small subunit rRNA gene fragment (18S) showed a genetic similarity with representatives of the superfamily Clausocalanoidea. Brooksia lacromae sp. nov. is described from zooplankton material collected at a marine monitoring station in the South Adriatic in the autumn of 2014. The description of both solitary and aggregate forms is given along with 18S rRNA and mitochondrial cox1 sequence data that provides strong evidence that both forms belong to the same species. The described species is morphologically markedly different from B. rostrata (Traustedt, 1893) and B. berneri van Soest, 1975, previously the only two species in the genus Brooksia. Genetic analysis based on 18S rRNA gene confirmed distinctness of B. lacromae sp. nov. from B. rostrata (1.5% uncorrected pairwise distance). The appendicularian Fritillaria helenae Bückmann, 1924, so far known from the Atlantic only, was found in the same samples as B. lacromae sp. nov. Co-occurrence of B. lacromae sp. nov. with an Atlantic appendicularian suggests an Atlantic or Western Mediterranean origin for this new taxon. Batistić, M., Viličić, D., Kovačević, V., Jasprica, N., Lavigne, H., Carić, M., Garić, R., Car, A., 2017. Phytoplankton winter blooms in the offshore south Adriatic waters are regulated by hydroclimatic events in the period 1995-2012. Geophysical Research Abstracts, 19th EGU General Assembly, EGU2017, 23-28 April 2017, Vienna, Austria., p. 6908. Data of phytoplankton abundance in winters of 1994 and 1995, and surface chlorophyll satellite-derived data (1997-2012) are the basis for investigation of characteristics and intensity of phytoplankton blooms in the open South Adriatic. Special attention is paid to the relation of different circulation regimes in the Ionian Sea (prevalently anticyclonic or cyclonic direction of Northern Ionian Gyre - NIG) to intensity of phytoplankton blooms. Different circulation regimes in the Ionian Sea cause inflow of water of different physical and biochemical properties into the Adriatic. Relatively high winter production events were evident in the open South Adriatic during both anticyclonic and cyclonic regimes. In the nutrient rich anticyclonic years, shallow vertical mixing is sufficient for enrichment of euphotic layers with the nutrients and development of the bloom, while in nutrient poor cyclonic years deep vertical mixing is necessary. Moreover, intense blooms have occurred in the years of specific hydroclimatic properties (i.e. East Mediterranean Transient – EMT and during extremely cold winters) and reversal years (from anticyclonic to cyclonic circulation of NIG and vice versa). In conclusion, winter season is important for production in the open South Adriatic waters and could not be omitted in the total yearly production estimates. Winter bloom intensity in the open South Adriatic depends on synergistic effects of local meteorological conditions and large time scale climatic variabilities in the Eastern Mediterranean on one hand, and water masses of different properties enteringthe Adriatic on the other. We investigated potential connections over the past two decades between mesoscale circulation regimes in the Ionian Sea and newly-observed planktonic tunicate species and concurrent rise in sea temperature in the Adriatic Sea. Analyses of plankton samples from 1993 to 2015 in the southern Adriatic revealed marked changes in the planktonic tunicate community. Eleven appendicularian and three thaliacean species were recorded for the first time in the Adriatic. 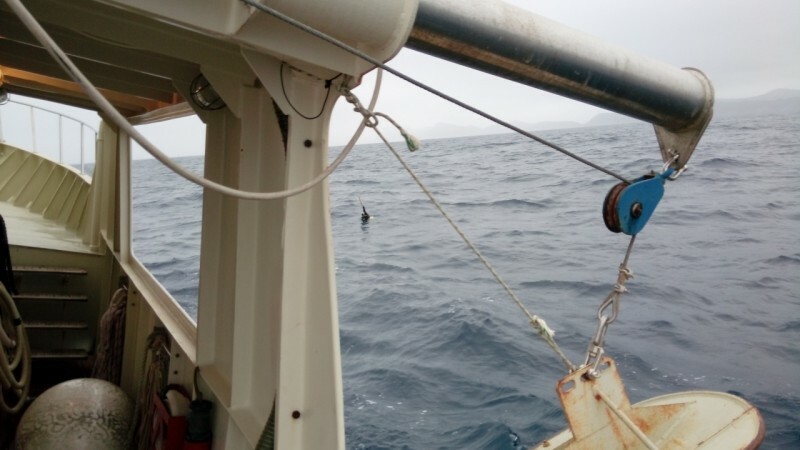 We found that incoming of these species are in connection with circulation regimes in the Northern Ionian Gyre (NIG). The occurrence of Atlantic/Western Mediterranean species coincided with anti-cyclonic circulation in the NIG, owing to the advection of Modified Atlantic Water into the Adriatic, while the presence of Lessepsian species coincided with the cyclonic pattern, which governs the entry of Eastern Mediterranean waters. 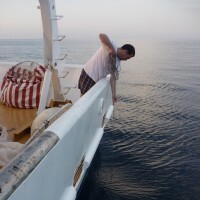 The impact has been that some newcomers now make a larger contribution to the zooplankton community in the southern Adriatic and, in certain cases, have replaced native species. The synergistic effects of these processes, together with warmer Mediterranean waters, raise concerns over dramatic changes in the marine biodiversity of the Adriatic. Car, A., Witkowski, A., Jasprica, N., Ljubimir, S., Čalić, M., Dobosz, S. 2017. Comparison among epilithic diatom communities from areas of invasive Caulerpa species (Caulerpa taxifolia and Caulerpa cylindracea) in the Adriatic Sea (NE Mediterranean). Book of the Abstracts of the 11th International Phycological Congress, Witkowski, A. (ed. ), University of Szczecin, Szczecin, Poland, 13-19 August 2017. Diatom community structures at locations under the influence of different invasive Caulerpa species; C. taxifolia and C. cylindracea, were compared in a two-year interval. Samples for taxonomic study were taken from coastal rocks at three stations (Island of Hvar, island of Mljet and Dubrovnik area) at eastern Adriatic Sea from November 2008 to October 2010. Light and electron microscopy examinations were used for qualitative analysis. Taxonomic analysis of diatom communities revealed altogether 388 epilithic taxa belonging in 63 genera including Hyalosynedra, Rhopalodia, Navicula, Cocconeis, Berkeleya, Tabularia, Nitzschia and Grammatophora as the most abundant. The study confirmed differences in species composition and abundance of epilithic diatoms among two Caulerpa sites. While the average number of taxa at C. taxifolia sampling site (the island of Hvar) was 77 per sample, the average number of taxa at C. cylindracea sampling sites (Dubrovnik and Mljet) was lower and amounted to 64 per sample. The highest values of Shannon-Wiener Diversity Index were during autumn and were almost the same for all three sampling sites ranging from 5.26 to 5.34. As revealed by MDS ordination, location has more impact on diatom community structure than seasonal changes. ANOSIM test performed on species abundance data confirmed that the difference between diatom communities among different sampling seasons was not significant. The results indicate that the influence of invasive seaweed of genus Caulerpa that change the habitat by competing with autochthonous algae diminishing the structural complexity, richness of species and diversity evident at the macroscopic level have impact on microflora as well. Results of this study presents the first study of the taxonomic composition and distribution of epilithic diatoms from areas of invasive Caulerpa spp., and it contributes to the broader and regional knowledge of diatom diversity in these challenged environments. Car, A., Hafner, D., Jasprica, N., Ljubimir, S., Dupčić Radić, I., 2016. Benthic diatoms of the small marine lake Mrtvo more (the island of Lokrum, Adriatic Sea). Book of Abstracts of the 5th Croatian Botanical Congress with International Participation, Rešetnik, I., Ljubešić, Z. (ed.). Zagreb, Primošten, Croatian Botanical Society, 75-76. The present study is being developed in the framework of a research project dealing with taxonomy and ecology of benthic diatomsin the Croatian part of southern Adriatic Sea. Starting in April 2016, 25 microscope slides were merged into a Dead Sea at the depth of 0.5m. The Dead Sea is semi-closed shallow marine ecosystem (maximum depth of 6 meters, the area of 0.1 ha), located within a special reserve of forest vegetation on the island Lokrum in front of Dubrovnik. During summer season, the Dead Sea is under significant anthropogenic influence (swimmers). The aim of this study is to explore the benthic diatom composition and abundance and seasonal dynamics of diatoms on a fine time scale. The experiment was carried out for 25 weeks and every week another microscope slide was taken out and gently plunged into sterile seawater. A quantitative biofilm assay was performed by light microscope (LM) observations by counting valves of life material under low magnification of 60x. Values were standardized to a sample surface of 1 cm2. Detail diatom analysis was performed on permanent slides of processed material (hydrogen peroxide treated) with Nikon E600 microscope under magnification of 1000x. 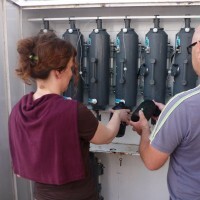 In order to make detailed analysis of benthic diatom assemblages of the Dead Sea and provide information about host-dependence, additional to samples of microscope slides, samples of rocks (epilithic diatoms) and green and brown macroalagae (epiphytic diatoms) were also collected and prepared for diatom analysis. During experiment, environmental conditions (temperature of the sea, salinity, nutrients and chlorophyll a) ware determined weekly. Car, A., Witkowski, A., Jasprica, N., 2016. Taxonomic composition of epiphytic diatoms from areas affected by invasive macroalgae Caulerpa taxifolia and Caulerpa cylindracea (Adriatic Sea, Croatia). The Second Croatian Symposium on Invasive Species with International Participation, Jelaska, S. et al. (eds.). Croatian Ecological Society, Zagreb, November 21-22, 2016, 54-54. The present study focuses on the taxonomy of epiphytic diatoms in areas affected by invasive macroalgae representing the the genus of Caulerpa J.V. Lamouroux, 1809 on the eastern Adriatic Sea coast. Material for the study of epiphytic diatoms was collected during two years (autumn 2008 – autumn 2010) from an area influenced by Caulerpa taxifolia (Vahl) C. Agardh in the bay of Stari Grad (the Island of Hvar), and from areas influenced by Caulerpa cylindracea Sonder in Dubrovnik and on the Island of Mljet (Gonoturska Bay). In order to compare epiphyte assemblages, sampling of coexisting autochthonous brown and green algae was conducted at the same stations. The samples were acid cleaned (HCl/H2O2) prior to qualitative analysis of diatoms using light microscope (LM) (Nikon E600 microscope) under magnification of 1000x. Light and electron microscopy examinations provide for the first time the information on the general morphology and ultrastructure of taxa, and enable a determination of the taxonomy of diatoms. The seasonal dynamics were described on a fine time scale. For the first time in the Central and Southern Adriatic Sea the composition of benthic diatoms and seasonal dynamics of taxa in areas affected by invasive macroalge Caulerpa taxifolia and Caulerpa cylindracea were determined. The results of this study enable a better understanding of the functioning of ecosystems dominated by macroalgae Caulerpa spp. Knowledge of the diatom community structure in the areas impacted by Caulerpa spp. is important for studies of the toxic effects of the host. Long-term variability of temperature, salinity and nutrients (nitrates, phosphates and silicates), collected between 1993 and 2016 in the open South Adriatic from 0 to 1200 m depth, are presented here. South Adriatic (SA) extends from the Palagruža Sill to the Otrant Sill and it’s the deepest part of the Adriatic Sea (about 1250 m). SA ecosystem is a true pelagic, with low terrestrial inputs and impact of the coastal waters on the nutrient budget. Notable influence is regular exchange of water with the Eastern Mediterranean through the Strait of Otranto. SA is an entry point for water masses originating from the Ionian Sea (IS) and a place of dense water formation for the eastern Mediterranean deep circulation cell. Water masses, entering the SA in larger amount during the winter, show decadal variability explained by different circulating regimes (cyclonic and anticyclonic) in the IS, referred to as "Bimodal Oscillating System” (BiOS). Considering temperature and salinity values, years 1993- 1996 and 2007-2012 were anticyclonic (lower temperature /less saline) and years 1997-2006 and 2013-2016 were cyclonic (higher temperature/more saline). The highest temperature and salinity values during the research period were observed in 2016. During 23 years of research significant variations in the nutrient concentrations are found. Annual medians of nutrients of the whole water column were as follows: nitrates from 0.2 μM (2000) to 3.7 μM (1995), phosphates from 0.03 μM (2004) to 0.21 _M (2014) and silicates from 1.7 μM (2002) to 6.2 μM (1995). Nutrients reached rather high levels of concentrations in 1990s, especially in 1995. These high nutrient levels in mid-1990s, coupled with low temperature and salinity values, are related to the inflow of the nutrient richerWestern Mediterranean waters, which enter to the Adriatic during the anticyclonic phase of the BiOS and was strengthened by the Eastern Mediterranean Transient (EMT) occurring in the early 1990s. Anticyclonic circulation is changed to cyclonic in 1997, accompanied by a decrease in nutrient concentrations which last till 2005. Nitrate and phosphate concentration increased again in 2006 and silicate concentration increased in 2007. During both years the BiOS reversal from cyclonic to anticyclonic was slower and did not completely change the Adriatic water mass properties in a short time as during the BiOS regime shift in the 1990s. Nitrate and silicate values were increased till 2009 and phosphates were increased only till 2007. The fall in concentrations of nitrate and silicate in 2010 and phosphate in 2008, during anticyclonic years, as well as increased concentrations of nitrate in 2013, phosphate in 2014-2015 and silicates in 2015-2016, during cyclonic years, indicate that nutrients concentration are not exclusively related to the BiOS but also by other biological (phytoplankton activity), biogeochemical and physical processes (vertical mixing). The South Adriatic (SA) is an entry point for water masses originating from the Ionian Sea (IS) and a place of dense water formation for the eastern Mediterranean deep circulation cell. Water masses, entering the SA in larger amount during the winter, show decadal variability explained by different circulating regimes (cyclonic and anticyclonic) in the IS, referred to as "Bimodal Oscillating System” (BiOS). 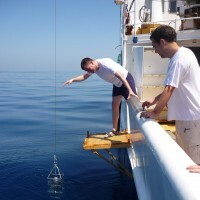 Sampling station was situated in the South Adriatic Pit (SAP) with depth of 1200 m. Micro- and nano-phytoplankton abundances, community structure, chlorophyll a concentrations, physical and chemical properties are presented in the winter and spring months for five consecutive years (2009–2013) during different circulating regimes of BiOS. Vertical convective mixing was regularly observed in winter except in 2011 which had effect on nutrient availability and consequently on biomass of primary producers. Effect of strong vertical mixing in February 2012 resulted with exceptionally high phytoplankton abundance and chlorophyll a concentrations in March of 2012. Strong convective mixing resulted in higher diatom abundances, comparing to winter when mixing did not occur. No such bloom was observed during investigated spring. Čalić, M., Ljubimir, S., Bosak, S., 2016. Unusual occurrence of tropical planktonic diatom species of the genus Chaetoceros in the South Adriatic. The Second Croatian Symposium on Invasive Species with International Participation, Jelaska, S. et al. (eds.). Croatian Ecological Society, Zagreb, November 21-22, 2016, 53-53. Two fairly uncommon species of planktonic diatoms of the genus Chaetoceros, Ch. bacteriastriodes and Ch. 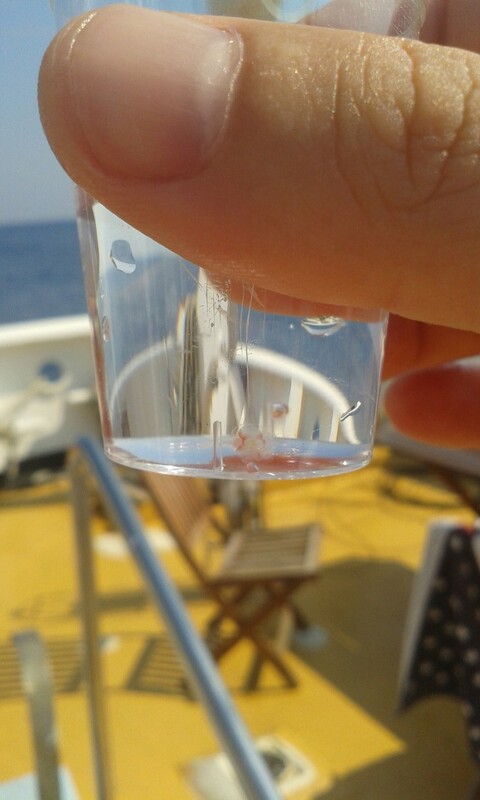 pseudosymmetrycus, were recorded during the study along the South Adriatic transect Dubrovnik-Bari in 2012 and 2015. Species were recorded by observing water samples under inverted microscope. 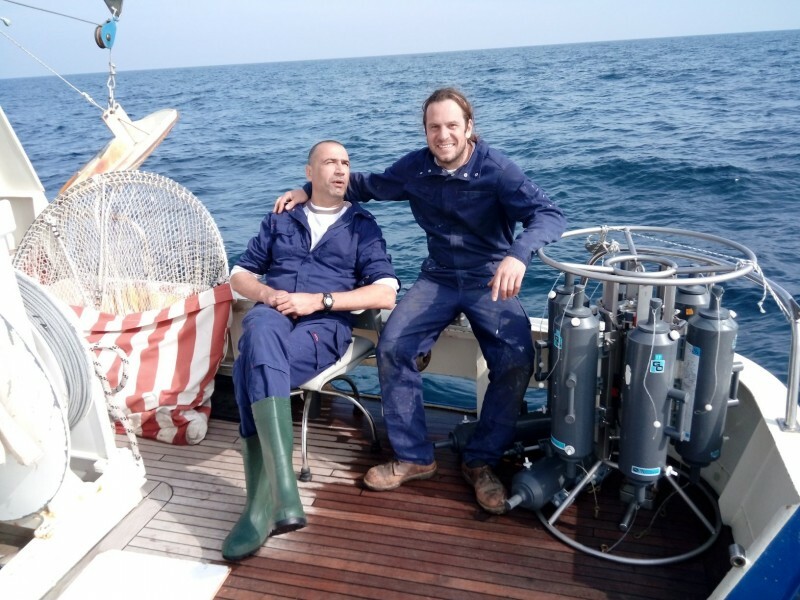 From a total of 89 examined samples unusual Chaetoceros species were recorded in 5 cases in the South Adriatic open waters (to a depth 0-100 m) during winter period. Their abundance did not exceed 102 cells L-1. Both species have been described from tropical waters, showing Indo- Pacific distribution, and very rarely recorded in the Mediterranean Sea. Areal expansion and introduction of new phytoplankton species might be related to changes in sea circulation in the South Adriatic or ballast water transport. 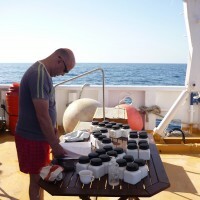 Recent investigations have shown that entering currents, of either Atlantic/Western Mediterranean or Eastern Mediterranean origin, modify the composition of the plankton community in the South Adriatic and each type of current brings different newcomers. Keywords: diatoms, genus Chaetoceros, South Adriatic, tropical species. Čalić, M., Car, A., Ljubimir, S., 2017. First records of the dinoflagellate of the genus Dicroerisma in the Adriatic Sea. Book of the Abstracts of the 11th International Phycological Congress, Witkowski, A. (ed. ), University of Szczecin, Szczecin, Poland, 13-19 August 2017. Several occurrences of planktonic dinoflagellate Dicroerisma psilonereiella (Gymnodiniales) were recorded during the long term study in South Adriatic open waters from 2011 to 2017. This taxon was recorded in 4 cases, mostly below 75 m and during winter-spring period. Abundance of D. psilonereiella in Adriatic did not exceed 102 cells L-1. Genus Dicroerisma has been described and reported primarily from the boreal and polar waters but nowadays it has been widespread in all the world oceans. Although it has been encountered in the Mediterranean those are the first findings in Adriatic Sea. 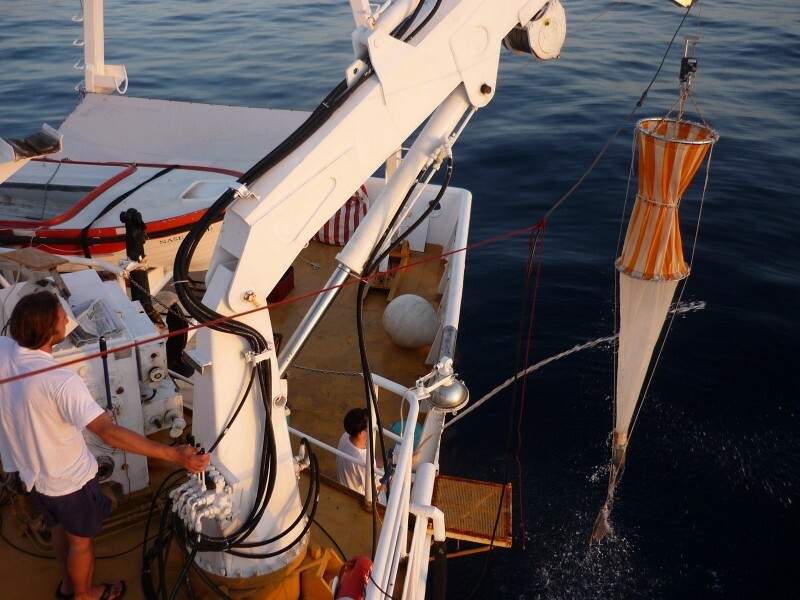 Recent investigations have shown that entering currents, of either Atlantic/Western Mediterranean or Eastern Mediterranean origin, modify the composition of the plankton community in the South Adriatic and each type of current brings different newcomers. Garić, R., Batistić, M. 2016. First record of Fritillaria helenae in the Mediterranean Sea. The Second Croatian Symposium on Invasive Species with International Participation, Jelaska, S. et al. (eds.). Croatian Ecological Society, Zagreb, November 21-22, 2016, 55-55. In the last two decades multiple new gelatinous planktonic species were recorded in the Adriatic. Their arrival has been positively correlated with increasing sea temperature as well as with different circulation patterns in the Ionian Sea. The direction of the Ionian Sea Gyre causes advection of different water masses in the Adriatic. During its cyclonic phase it brings mainly warm and saline Eastern Mediterranean water, while during anticyclonic phase it brings more of Atlantic and Western Mediterranean waters. Here we present first record of Fritillaria helenae (Tunicata, Appendicularia) for the Mediterranaen Sea (Garić and Batistić, 2016). Fritillaria helenae was so far only known from the Atlantic. It was found in the South Adriatic in autumn 2014 when a marked drop in salinity was recorded, which suggests increased inflow of Atlantic/Western Mediterranean waters into the Adriatic. Ursella, L., Cardin, V., Batistić, M., 2017. 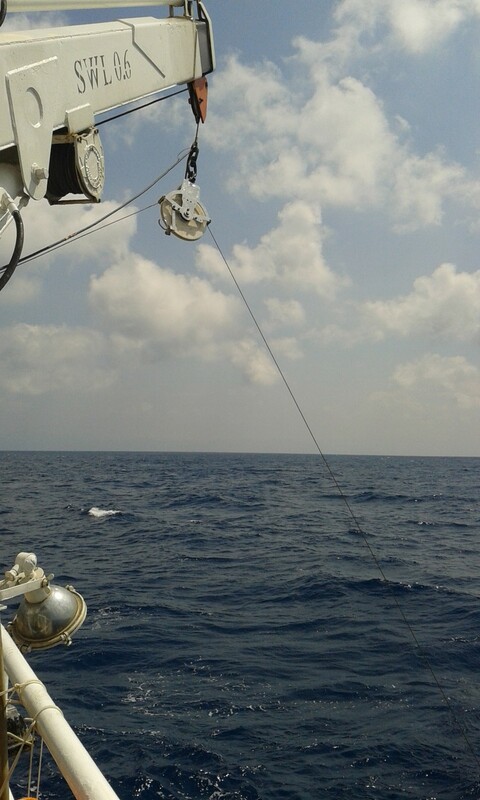 Evidence of zooplankton vertical migration from continuous Southern Adriatic buoy current-meter records (E2-M3A). Geophysical Research Abstracts, 19th EGU General Assembly, EGU2017, 23-28 April 2017, Vienna, Austria., p. 4549. 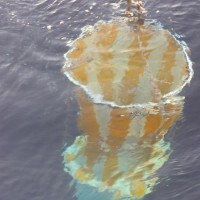 The E2-M3A Station is deployed in the southern Adriatic Sea, at about 1200 m depth, in the center of the cyclonic gyre where deep convection process takes place, involving both the atmosphere and the ocean dynamics and forming new dense and oxygenated waters, thus triggering the solubility and the biological pump. 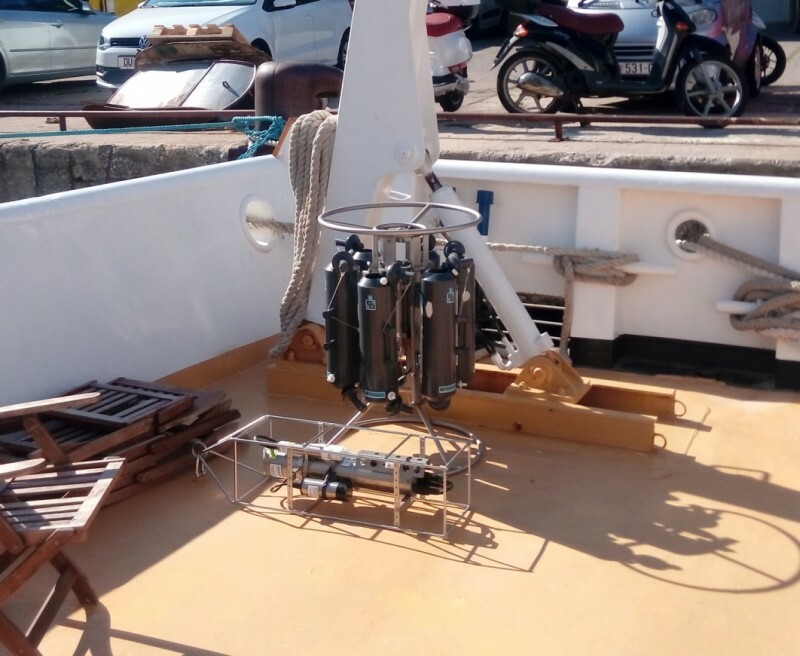 In particular, the E2M3A is equipped with an upward looking 150 kHz RDI-Acoustic Doppler Current Profiler (ADCP) positioned between 265 and 320 m depth, with a vertical resolution of 5 m and a range of 250-300 m. The mooring line has been in water since November 2006, with an interruption from September 2010 until May 2011. 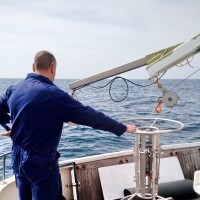 ADCP backscattering signal is very useful in determining zooplankton distribution and variability at various time scales, including seasonal/annual behavior and diel vertical migration (DVM). 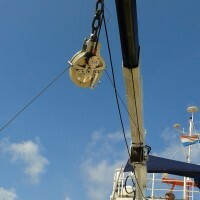 From ADCP backscattering signal, backscattering strength (Sv) was calculated for the entire dataset. Sv permits to quantify qualitatively the scatters present in the water, i.e. the particulate and/or the phyto/zoo-plankton. 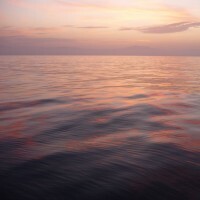 Zooplankton distribution is dependent on phytoplankton presence and blooms, which on its own depend on nutrients availability (related to wind-induced vertical mixing), but also on sunlight. The variation in time of Sv together with vertical velocity allows for measuring DVM of zooplankton and its variability with seasons and years. Alternation of high and low values for Sv are present all year long with differences in intensities in particular in the surface layer. 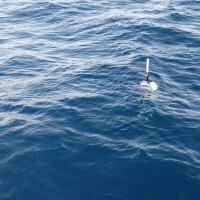 Quite high values for Sv are found in spring and summer; in spring they are found along a large part of the water column, while in summer they are detected prevalently in the upper part of the measurement range. This behavior is related to the conditions of the water column, i.e. 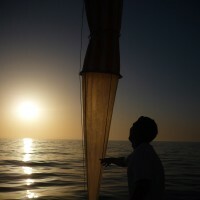 mixing and nutrients availability, which influence phytoplankton blooms and therefore zooplankton growing and movements. Correlating Net Primary Production obtained from model and Mixed Layer Depth, a delay of two months in the bloom of phytoplankton with respect to deepest mixing is found. Power Spectra of Sv show a major peak at 24 h that corresponds to the classical nocturnal-diurnal migration, and a secondary important peak at the period of 12 hours that indicates a different type of DVM pattern, the twilight migration. The ultimate factor behind DVM seems to be the minimization of the risk of predation from fishes and other carnivorous groups. Calculating the monthly mean daily cycle of the Sv, it is evident that there is a decrease in Sv at sunrise, while it increases at sunset. The highest values in the derivative of Sv, as well as highest values in the vertical velocity (w), coincide in time with sunset and sunrise. In particular, w is negative (downward movement) at sunrise while it is positive (upward movement) at sunset, and in some cases absolute value of w (|w|) reaches 5 cm/s. The hour of occurrence of |w| greater than 4.5 cm/s follows the curves in time of the hours of sunset and sunrise, which are changing throughout the year. Unusual occurrence of planktonic diatom species, Chaetoceros bacteriastroides and Chaetoceros pseudosymmetricus, was noticed in three different marine ecosystems of Adriatic Sea: the Krka Estuary and Telaščica Bay in the Central Adriatic, and in southern Adriatic offshore. From 2010 to 2015, these two Chaetoceros species were recorded in heterogeneous environmen-tal conditions and in a very low abundances. Both species are regarded as very rare in world oceans, and consequently knowledge of their distribution and ecology is rather poor. Primarily described from tropical waters and showing Indo-Pacific distribution, C. bacteriastroides and C. pseudosymmetricus findings in Adriatic represent the northernmost records in world's oceans and seas. For C. pseudosymmetricus this is also the first occurrence in European seas. Areal expansion and introduction of new phytoplankton species in the Adriatic Sea might be related to different circulation regimes in the Ionian Sea and the concurrent rise in sea temperature in the Mediterranean in the last decade. 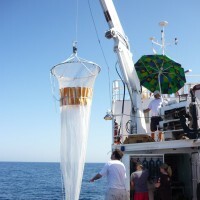 Recent investigations have shown that entering currents, of either Atlantic/Western Mediterranean or Eastern Mediterranean origin, modify the composition of the plankton community in the Adriatic by bringing different newcomers. Čalič et al 2017 Chaetoceros. Šilović, Tina; Mihanović, Hrvoje; Batistić, Mirna; Dupčić Radić, Iris; Hrustić, Enis; Najdek, Mirjana, 2018. Picoplankton distribution influenced by thermohaline circulation in the southern Adriatic. Continental Shelf Research 155, 21–33. In this study, we focus on the interactive dynamics between physico-chemical processes and picoplankton distribution in order to advance our current understanding of the roles of various parameters in regulating picoplankton community structure in highly dynamic marine system such as the South Adriatic Sea. 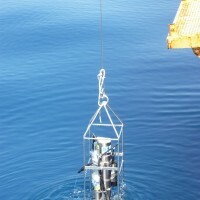 The research was carried out between October 2011 and September 2012 along the transect in the northern part of the South Adriatic Pit. 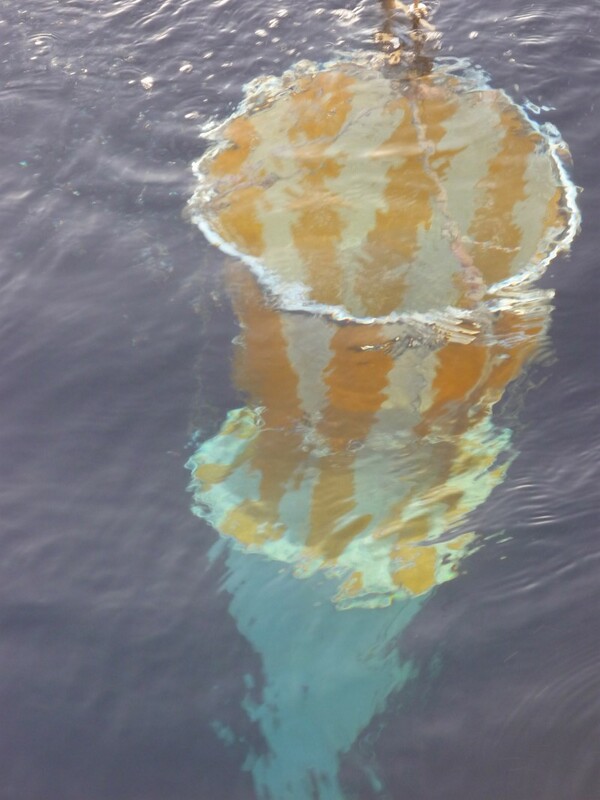 The deep water convection occurred in the southern Adriatic during February 2012, with vertical mixing reaching the depth of 500 m. The picoplankton community was highly affected by this mixing event, whilst its compartments each responded differently. During deep water convection low nucleic acid heterotrophic bacteria (LNA HB) and Synechococcus had their lowest abundances (4 × 105 cell ml−1 and 8 × 102 cell ml−1, respectively), picoeucaryotes had their highest abundances (104 cell ml−1), while Prochlorococcus was absent from the area, most likely due to intense cooling and vertical mixing. 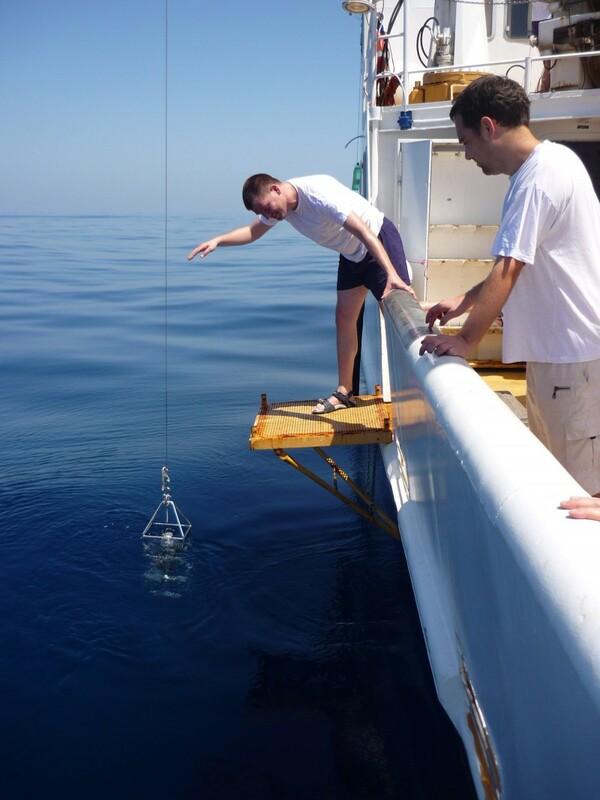 In March 2012 Eastern Adriatic Current (EAC) brought warm and saline water with more nutrients, which resulted in the proliferation of high nucleic acid heterotrophic bacteria (HNA HB), having maximal abundance (4 × 105 cell ml−1). The re-establishment of Levantine Intermediate Water (LIW) intrusion after the deep water convection resulted in the re- appearance of Prochlorococcus and maximal abundances of Synechococcus (4 × 104 cell ml−1) in May 2012. The distribution of picoheterotrophs was mainly explained by the season, while the distribution of picophytoplankton was explained by the depth. Aside from nutrients, salinity was an important parameter, affecting particularly Prochlorococcus. The re-appearance of Prochlorococcus in the southern Adriatic during the period of LIW intrusion, together with their correlation with salinity, indicates their potential association with LIW. The relationship between Prochloroccocus distribution and physico-chemical environmental parameters provides an important insight into the ecological roles and niche preferences of this group. Čalić, Marijeta; Ljubimir, Stijepo; Bosak, Sunčica; Car, Ana, 2018. First records of two planktonic Indo-Pacific diatoms: Chaetoceros bacteriastroides and C. pseudosymmetricus in the Adriatic Sea. Oceanologia 60, 101–105. Ursella, Laura; Cardin, Vanessa; Batistić, Mirna; Garić, Rade; Gačić, Miroslav, 2018. 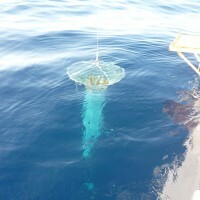 Evidence of zooplankton vertical migration from continuous Southern Adriatic buoy current-meter records. // Progress in oceanography 167, 78-96. 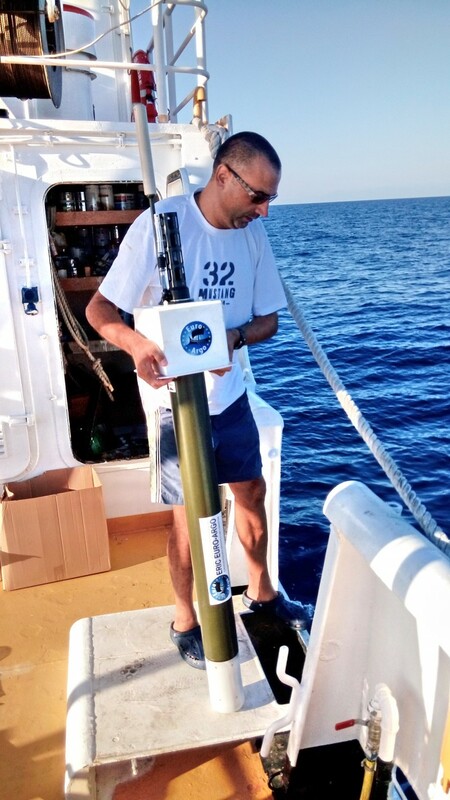 From the eleven-year data record at the Southern Adriatic Observatory (E2M3A), we study for the first time in the Adriatic Sea the strength of the backscatter signal from an Acoustic Doppler Current Profiler (ADCP) in relation to zooplankton vertical movement. 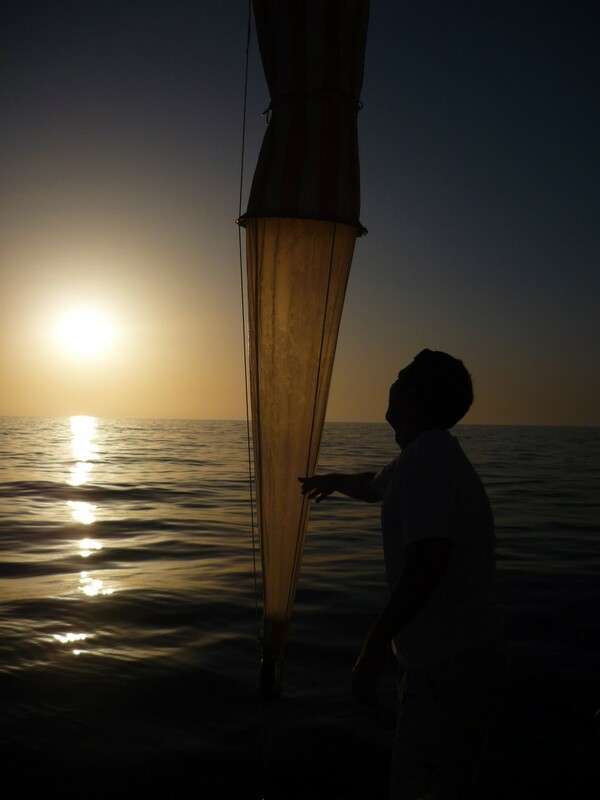 The signal represents well the general behaviour of the zooplankton to sink at dawn and to emerge at the sunset. The modulation of the signal along the year is linked in particular to the different environmental conditions and the presence of different zooplankton groups. The correlation between the backscatter signal and distinct zooplankton groups (copepods, euphausiids, ostracods, appendicularians, salps) shows that in different seasons and environmental conditions, different groups are responsible for the strength of the signal. Furthermore, the backscatter signal, interpreted in terms of the qualitative composition of the zooplankton community, provides important information on the behaviour and habits of zooplankton in the southern Adriatic. 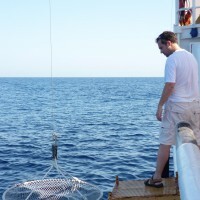 Poorly known aspects of zooplankton behaviour are described in more detail, such as: recovery of zooplankton vertical distribution after mixing events, vertical migration in conditions of increased food availability at depth due to vertical mixing, modulation of vertical migration in dependence of the lunar phase and vertical migration in relation to deep chlorophyll maximum position. 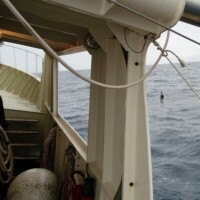 In addition, the present study emphasizes the possible influence of gelatinous zooplankton at the open sea on high backscatter values during the warmer part of the year. Kaleli, Aydin ; Krzywda, Marta ; Witkowski, Andrzej; Riaux-Gobin, Catherine; Solak, Cüneyt Nadir; Zgłobicka,Izabela; Płociński,Tomasz; Grzonka, Justyna; J. Kurzydłowski, Krzysztof; Car, Ana; Desrosiers, Catherine; Kaska, Yakup; Mccartney, Kevin, 2018. A new sediment dwelling and epizoic species of Olifantiella (Bacillariophyceae), with an account on the genus ultrastructure based on Focused Ion Beam nanocuts. Fottea, Olomouc 18, 212–226. The marine diatom Olifantiella Riaux–Gobin et Compère predominantly occurs in tropical Indo–Pacific coral reef environments. The genus has about a dozen validly published taxa and is characterized by transapically elongate striae composed of a macroareola, broad perforated girdle, and tubular buciniportula process of trumpet–shape. The valve mantle of taxa related to the generitype, O. mascarenica, have a canal–shaped structure around the valve at the face / mantle junction, while those to O. gorandiana have a simple mantle or strongly narrow canal and complex buciniportula composed of hollow processes. The geographic distribution of Olifantiella is expanded in this study to include species observed in loggerhead sea turtles scrapes from the Aegean Turkish coast and samples from the Turkish Black Sea and Adriatic Sea coasts. Olifantiella has also been identified in Martinique Island, Caribbean Sea. A transfer of Navicula infirmitata is proposed due to the areola and buciniportula structure, as Olifantiella infirmitata. Further, an application of the Focused Ion Beam (FIB) to a sequential cutting of frustules allows resolution of Olifantiella mascarenica valve ultrastructure. Hafner, Dubravka; Jasprica, Nenad; Car, Ana, 2018. Taxonomic survey of benthic diatoms in Neum Bay, southeastern Adriatic. Natura Croatica 27, 1–26. The objective of this work was to contribute to the knowledge of microphytobenthos in the Adriatic Sea, by studying for the first time the benthic diatom communities in Neum Bay in Bosnia and Herzego­vina. For this purpose, the benthic diatoms naturally growing on stones and macroalgae were identified at one station in the small semi-enclosed oligotrophic Neum Bay during 2010 and 2011. A total of 24 samples were collected at two different depths, 0.5 m and 8 m, and analysed with light and scanning electron microscopy. Altogether, 425 pennate and 58 centric taxa (species and infraspecific taxa) belonging to 60 families and 115 genera were noted. Genera with the greatest number of taxa were: Mastogloia (46 taxa), Navicula (36), Diploneis (35), Nitzschia (34), Amphora (31), Cocconeis (27), Achnanthes (14), Halamphora (12), Lyrella (11), and Surirella and Licmophora (10 each). Amphora bigibba var. interrupta and Cocconeis scutellum were the most frequent taxa, being present in 87.5% of the samples. In total, 142 taxa were found only once (sporadic taxa). Although benthic diatom richness is high in the bay, taxa are apparently not distributed evenly temporally. Consistent quantitative and qualitative data are still needed for a better determination of the seasonal and spatial changes of the epilithic assemblages in the region. Hafner, Dubravka; Car, Ana; Jasprica, Nenad; Kapetanović, Tatjana; Dupčić Radić, Iris, 2018. Relationship between marine epilithic diatoms and environmental variables in oligotrophic bay, NE Mediterranean. Mediterranean Marine Science 19, 223–239. The taxonomic composition and structure of a marine epilithic diatom community were sampled from the bottom of the two sites at monthly intervals from January to December 2011 in the small semi-enclosed oligotrophic Neum Bay in Bosnia and Herzegovina (Middle Adriatic). Altogether, 264 diatom taxa (species and infraspecific taxa) within 69 genera were identified. Among them, 149 and 203 taxa occurred in samples from the shallow (0.5 m depth) and deep (8 m depth) sites, respectively. The monthly distribution of most of the diatoms was irregular and high numbers of sporadic taxa were found. SIMPER analysis indicated that the difference between shallow and deep sites could be largely attributed to the frequently recorded diatom taxa and those with high percentage abundances. They were Halamphora coffeiformis, Caloneis excentrica, Cocconeis scutellum var. scutellum, Licmophora flabellata, Licmophora gracilis, Licmophora sp., Navicula abunda, Rhabdonema adriaticum, and Striatella unipunctata. Canonical Correspondence Analysis (CCA) showed that temperature, oxygen saturation (O2/O2′), silicate concentration (SiO4), and salinity were the most important factors influencing diatom community structure in the bay. 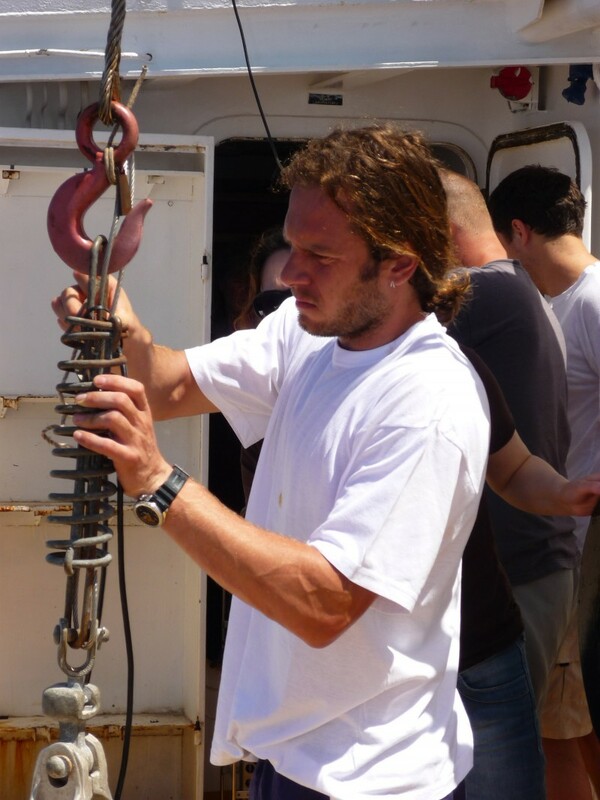 This study wasconducted in February, April and June 2009 at three stations in the southernAdriatic. Occurrence of the dinoflagellate Noctilucascintillans and tunicates Salpafusiformis and Salpa maxima inhigh abundances for the oligotrophic open sea, indicates the importance ofphysical forcing (vertical mixing) and inflow of nutrient-enriched Atlantic water,due to the Bimodal Oscillating System (BiOS) mechanism, into the Adriatic Seathus creating an environment favourable for their rapid increase. This is thefirst time a bloom of N. scintillanshas been recorded in the open southern Adriatic (OSA). High abundance of Noctiluca and salp populations in theOSA was characterized by low abundance of phytoplankton and other zooplankton,with obvious trophic implications (reduction of food availability to crustaceanprimary consumers). Moreover, during the S.maxima bloom in June 2009, calanoid copepods and appendicularians werealmost completely absent (< 1 ind. m-3). 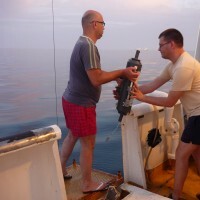 Batistić, M., Viličić, D.,Kovačević, V., Jasprica, N., Garić, N., Lavigned, H., Carić, M., 2019.Occurrence of winter phytoplankton bloom in the open southern Adriatic:Relationship with hydroclimatic events in the Eastern Mediterranean.Continental Shelf Research 174, 12–25. 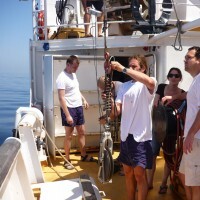 Thecharacteristics and intensity of winter phytoplankton blooms in the OpenSouthern Adriatic (OSA) were investigated from 1994 to 2012 by combiningavailable unpublished and literature data on phytoplankton abundance, in situchlorophyll-a (Chl-a) and satellite-derived Chl-a surface data. 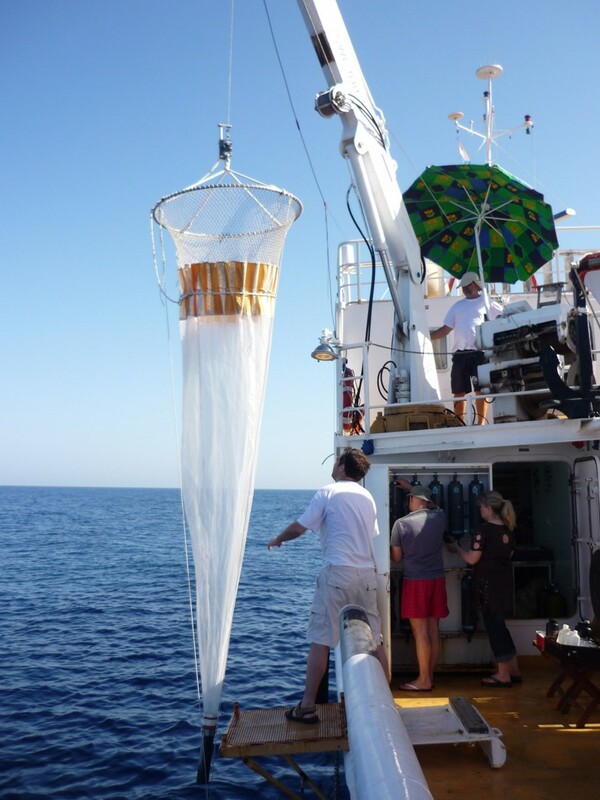 We usedoriginal data from Februaries 1994 and 1995 (phytoplankton, physico-chemicaland meteorological data), the years affected by East Mediterranean Transient(EMT), and analysed them in relation to data available from literature forwinters of 1997 and from 2007 to 2012. Chl-a satellite data from 1998 to 2012was used to get insight into large scale bloom dynamics with fine temporal andspatial resolution. 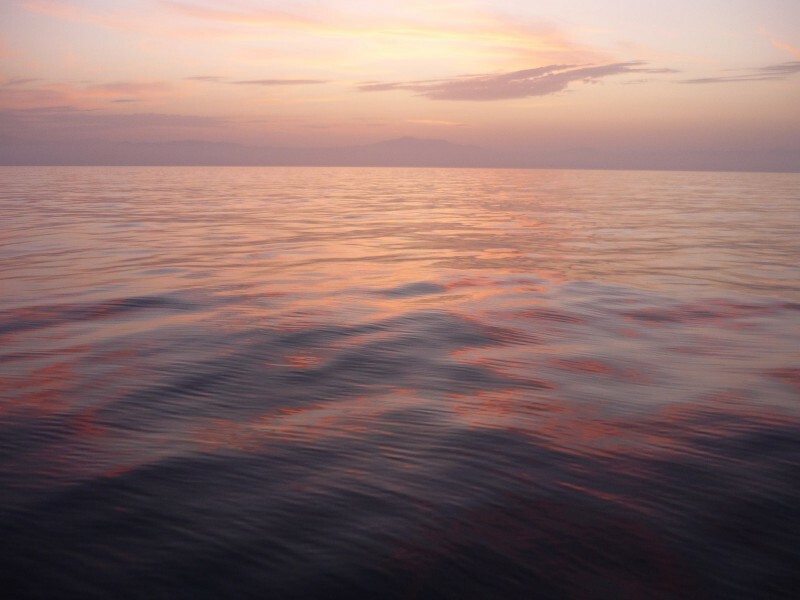 Particular attention was paid to the different circulationregimes in the Ionian Sea, namely to the anticyclonic and cyclonic phases ofthe Northern Ionian Gyre (NIG), both of which influence the physical andbiochemical properties of the Southern Adriatic. The presented data demonstratethat winter blooms are persistent features of the OSA and they can occur duringboth anticyclonic and cyclonic phases of the Northern Ionian Gyre, but bydifferent mechanisms. Moreover, intense blooms have occurred under certainhydroclimatic conditions such as the Eastern Mediterranean Transient (EMT) andextremely cold winter years. This was also confirmed by cluster analysis basedon satellite Chl-a distribution. 1. 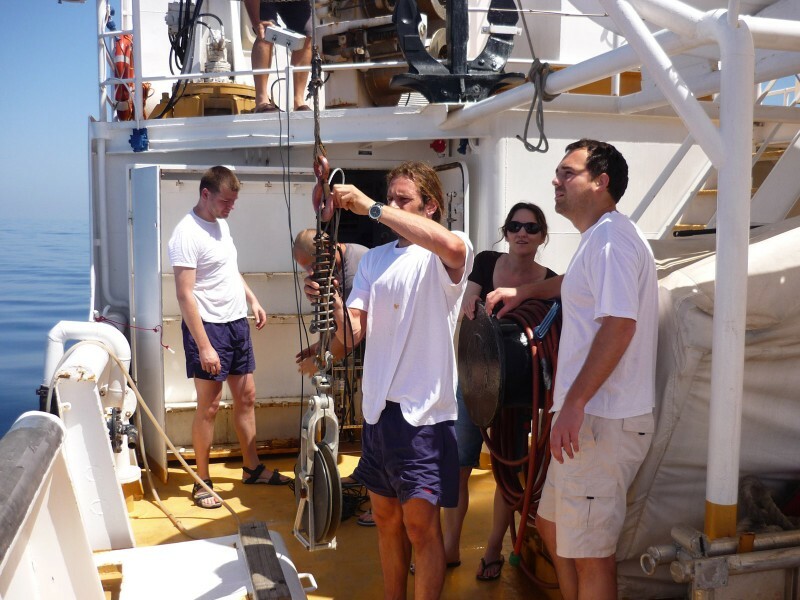 1 December 2016 : Samples were taken at all stations and depths, two days, R/V Naše More. 2. 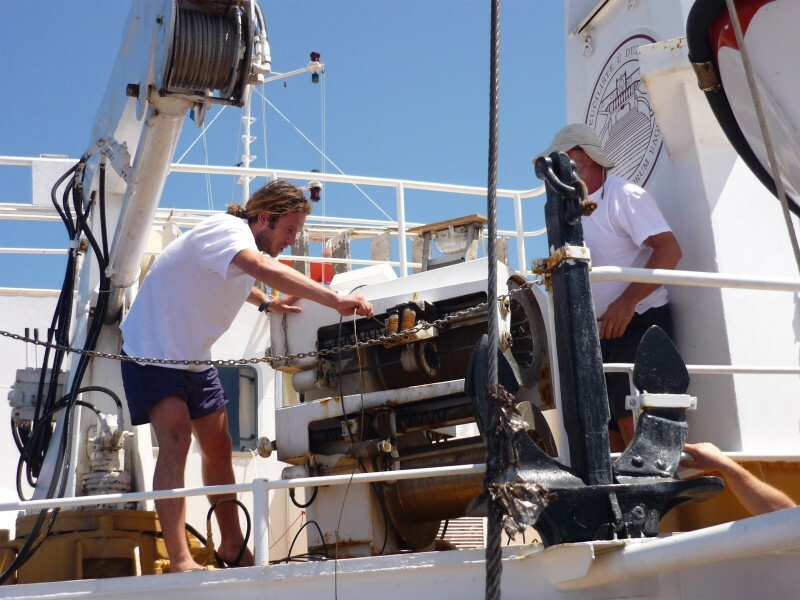 20 January 2017 : Samples were taken at all stations and depths, throughout day-night, R/V Naše More. 3. 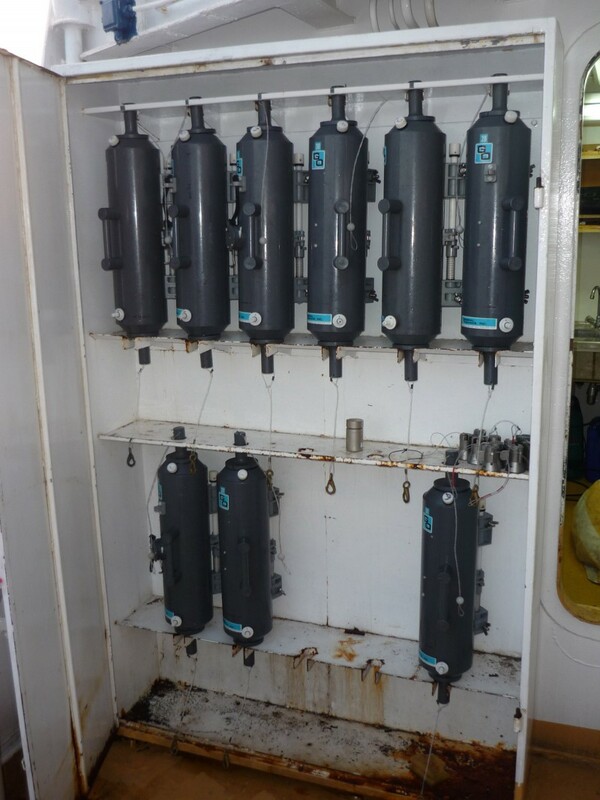 8 February 2017 : Samples were taken at all stations and depths, throughout day-night, R/V Naše More. 4. 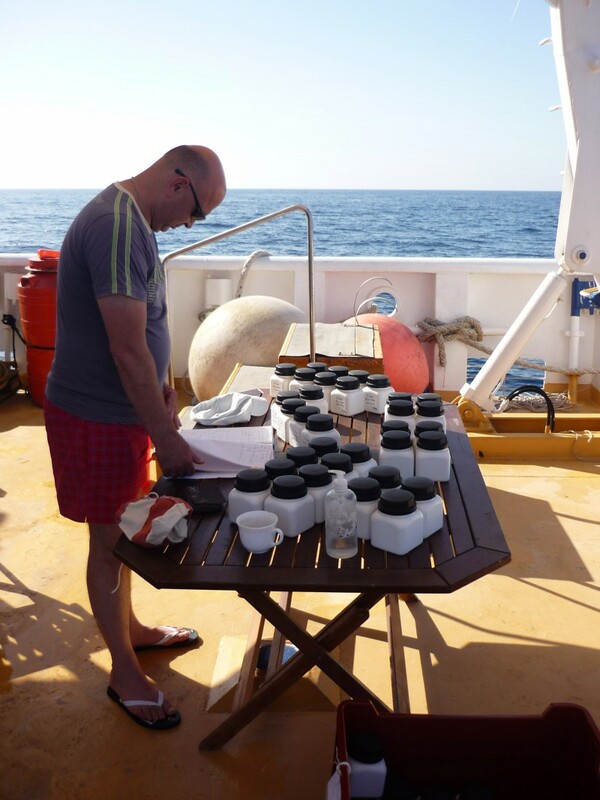 16 February 2017 : Samples were taken at all stations and depths, two days, R/V Naše More. 5. 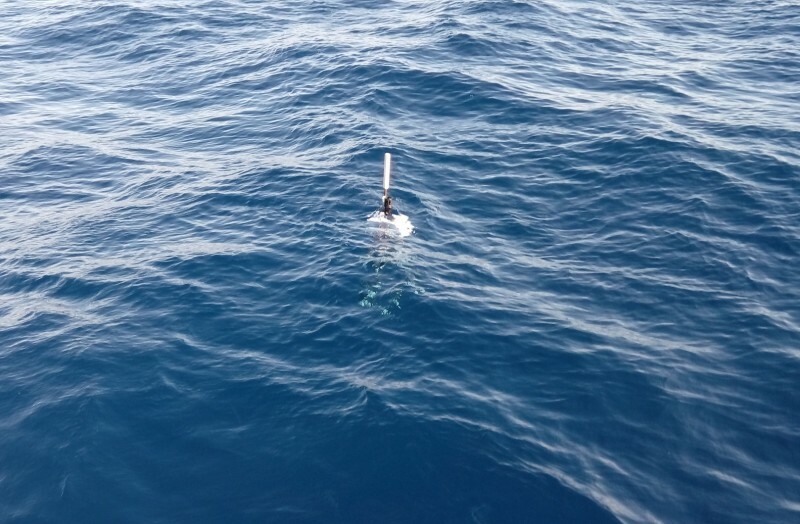 3 March 2017 : All samples were taken till 300 m depth on the P-1200 station; on the P-1000 station Niskin bottle samples were taken, while on other stations CTD-prolfiles (CTD multiparametric probe) were surveyed., one day, R/V Naše More. 6. 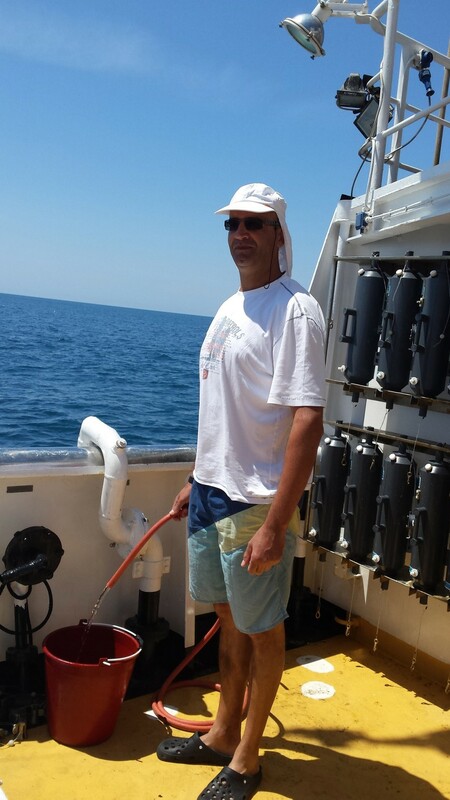 20 March 2017 : On the P-1200 and P-300 stations, all samples were taken till 300 m depths, while on other stations CTD-prolfiles were surveyed only, one day, R/V Baldo Kosić. 7. 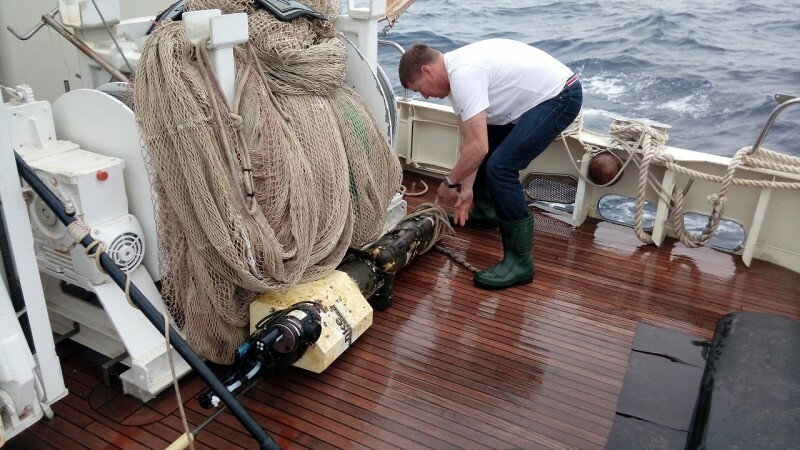 24 March 2017 : On the P-1200 all samples were taken, on the P-1000 CTD-prolfiles were surveyed only, one day (Crew members returned at 00:15 the following day), , R/V Naše More. 8. 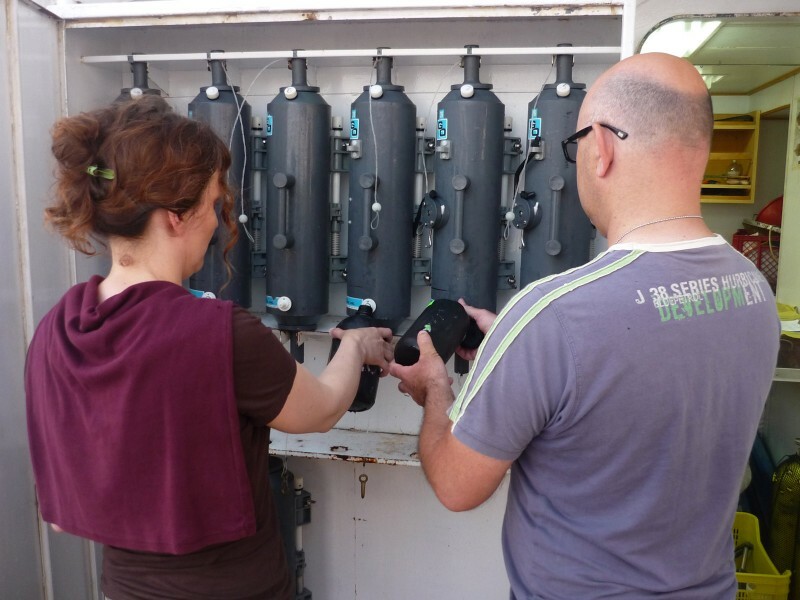 5 April 2017 : Samples were taken at all stations and depths, throughout day-night, R/V Naše More. 9. 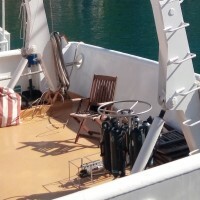 4 May 2017 : Samples were taken at all stations and depths, throughout day-night, R/V Naše More. 10. 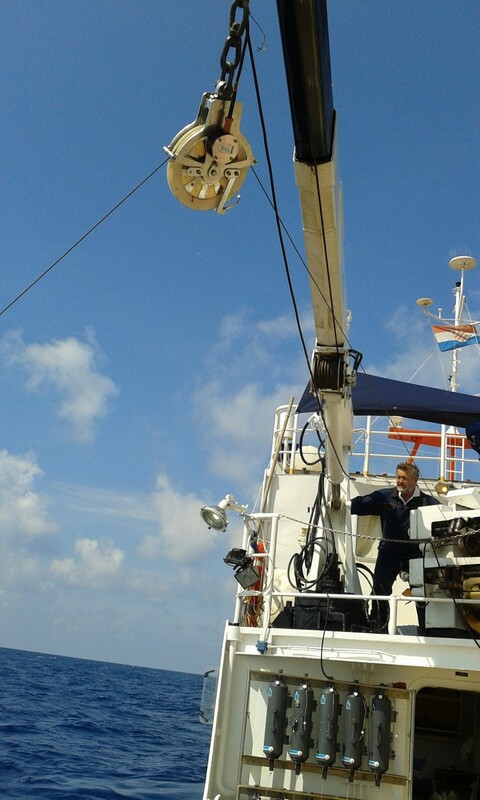 24 May 2017 : All samples were taken on the P-1200 station; on the P-1000 CTD-profiles were surveyed only, one day, R/V Naše More. 11. 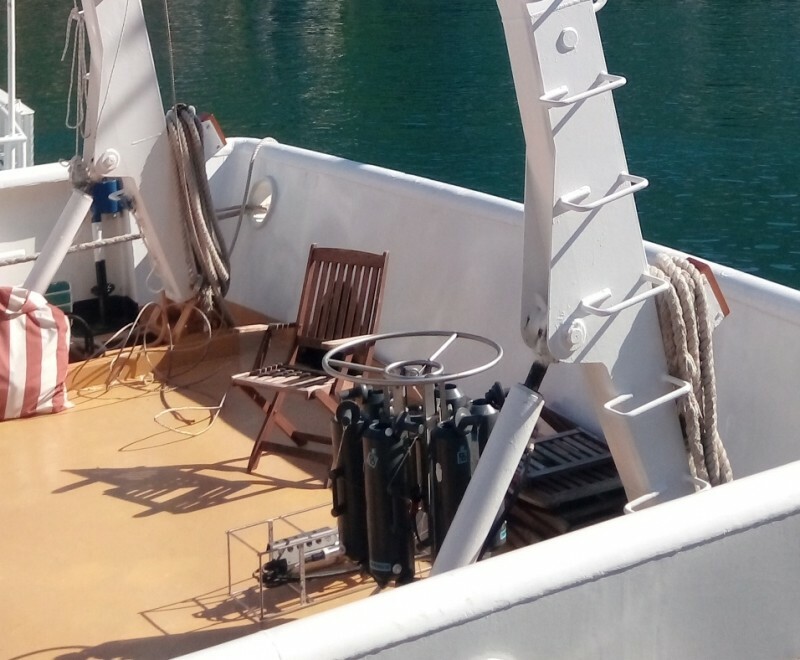 29 May 2017 : All samples were taken on the following stations: P100, lokrum, P150, P300; one day, R/V Naše More. 12. 13 June 2017 : Samples were taken at all stations and depths, throughout day-night, R/V Naše More. 13. 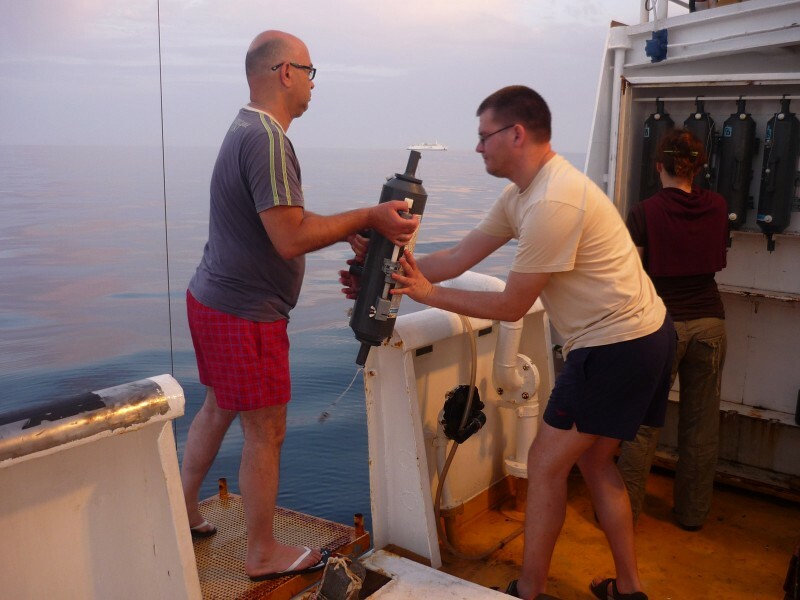 5 July 2017 : Samples were taken at all stations and depths, throughout day-night, R/V Naše More. 14. 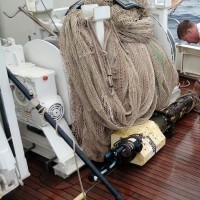 28 July 2017: Samples were taken at all stations and depths, throughout day-night, R/V Naše More. 1. 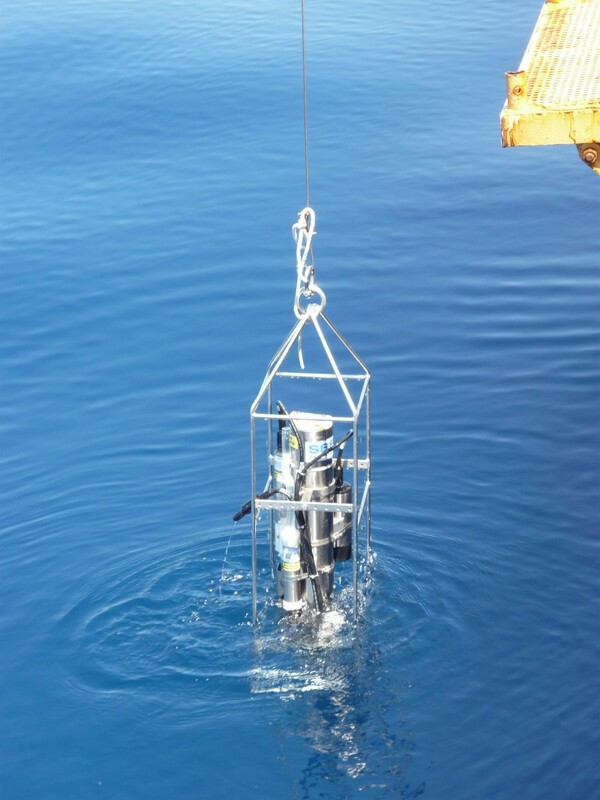 25 January 2018: Samples were taken at all stations (P-100, P-150, P-300, P-1200) and depths, two days, R/V Naše More. 2. 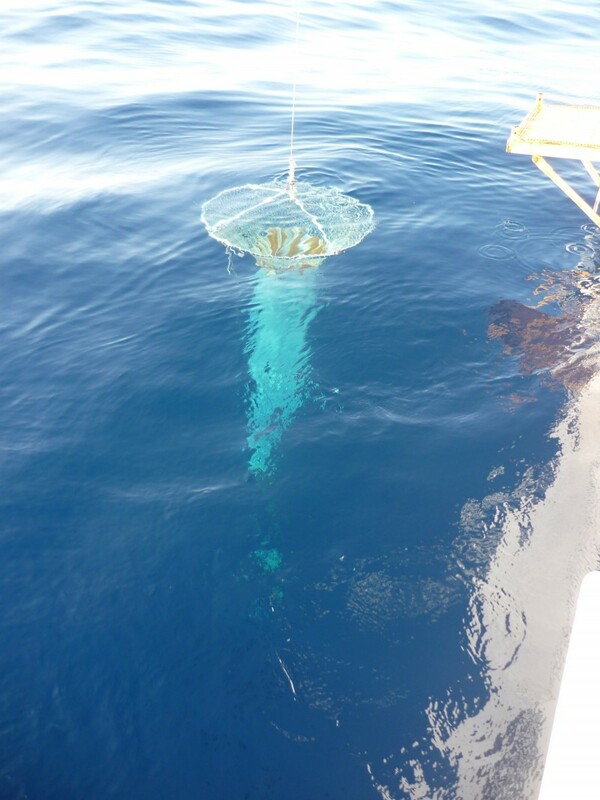 5 February 2018: Samples were taken at all stations (P-100, P-150, P-300, P-1200) and depths, two days, R/V Naše More. 3. 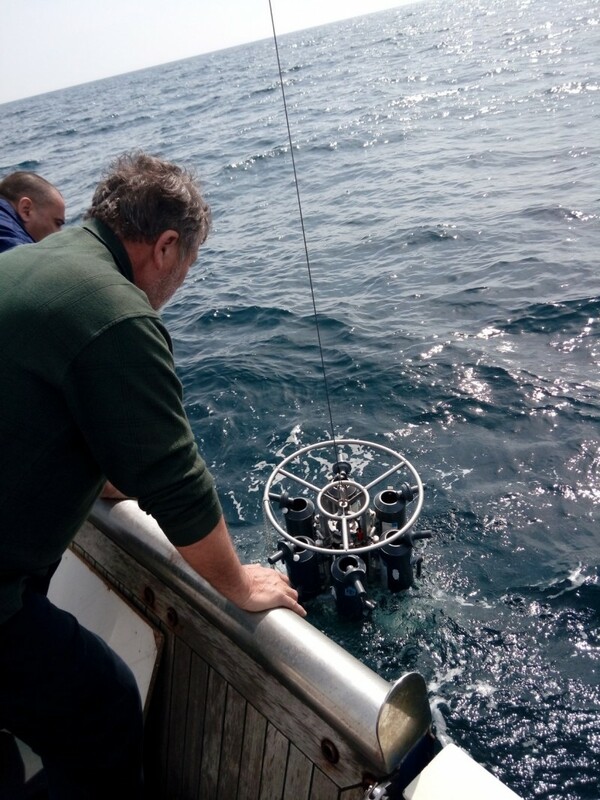 9 March 2018: Samples were taken at all stations (P-100, P-150, P-300, P-1200) and depths, two days, R/V Naše More. 4. 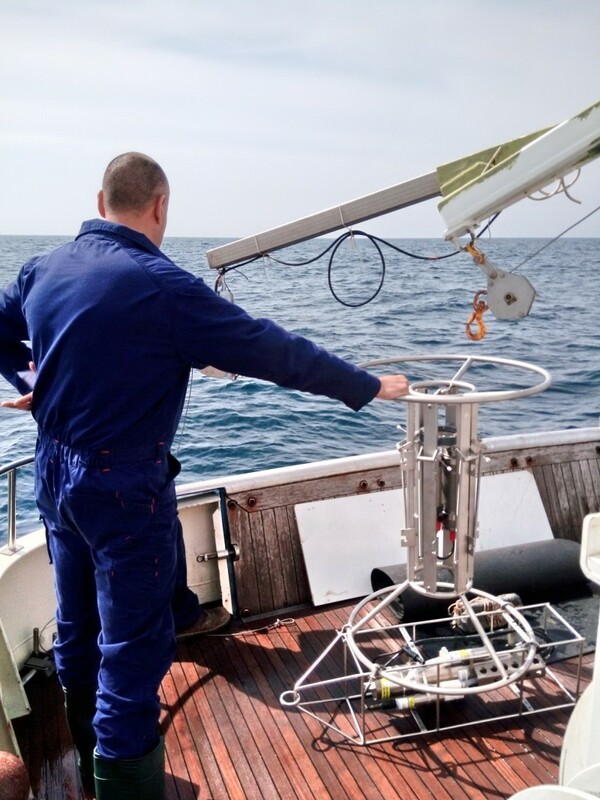 14 March 2018: Samples were taken at all stations (P-100, P-150, P-300, P-1200) and depths, two days, R/V Naše More. 5. 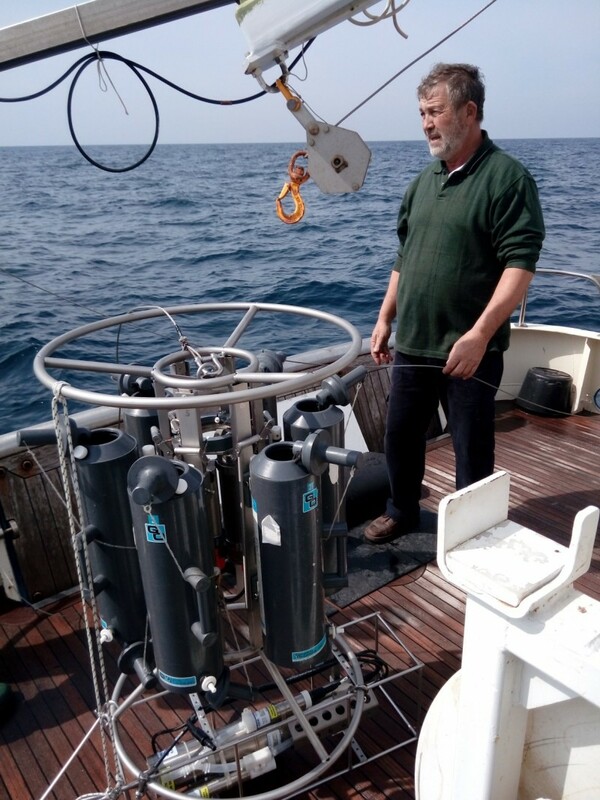 10 April 2018: Samples were taken at all stations (P-100, P-150, P-300, P-1200) and depths, two days, R/V Naše More. 6. 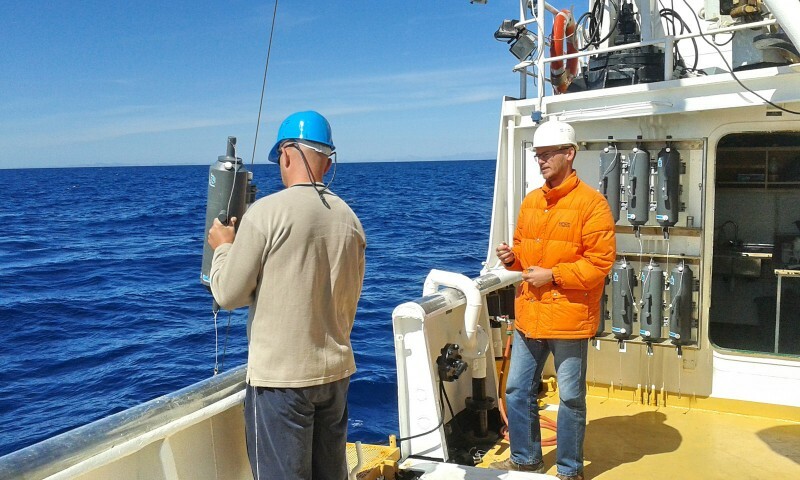 17 April 2018: Samples were taken at all stations (P-100, P-150, P-300, P-1200) and depths, two days, R/V Naše More. 7. 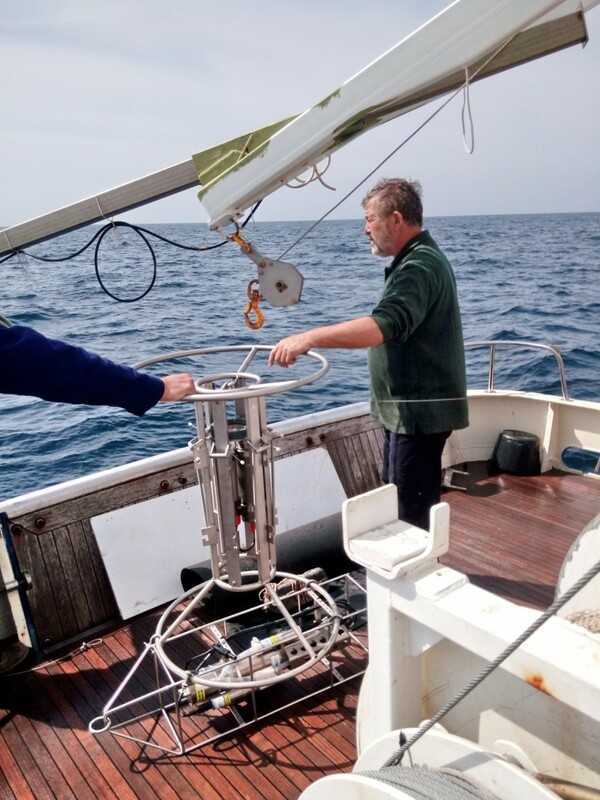 17 May 2018: Samples were taken at all stations (P-100, P-150, P-300, P-1200) and depths, two days, R/V Naše More. 8. 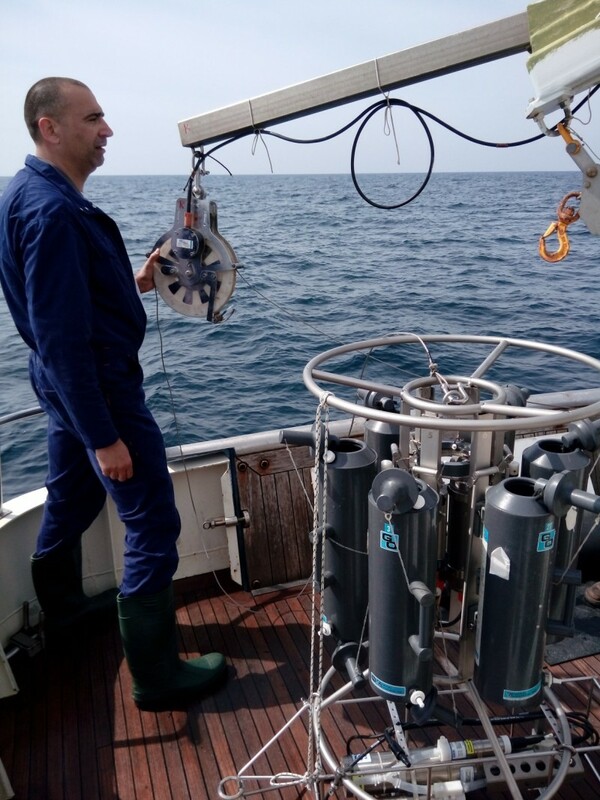 4 June 2018: Samples were taken at all stations (P-100, P-150, P-300, P-1200) and depths, two days, R/V Naše More. 9. 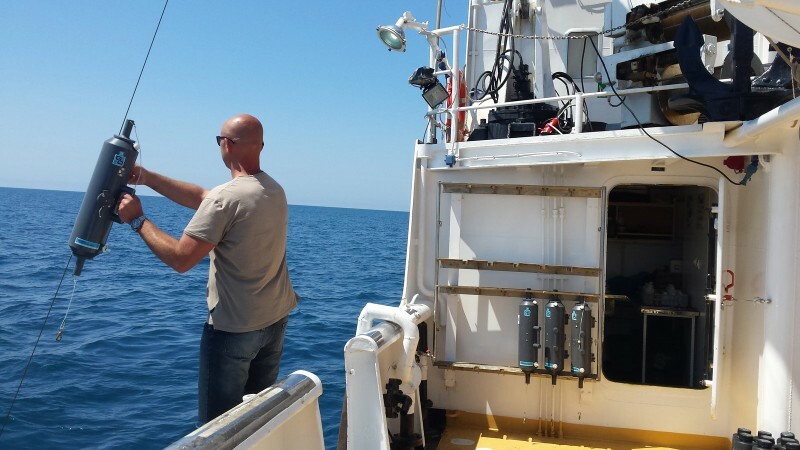 20 June 2018: Samples were taken at all stations (P-100, P-150, P-300, P-1200) and depths, two days, R/V Naše More. 10. 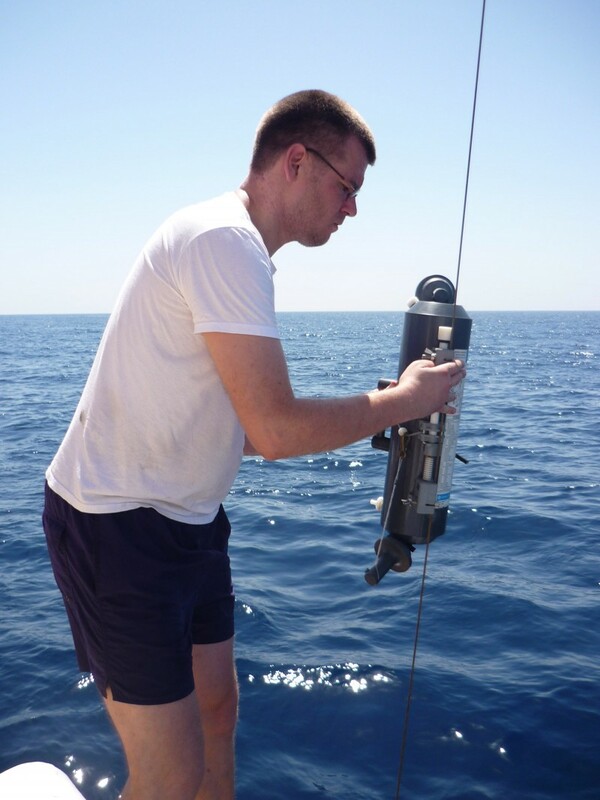 5 July 2018: Samples were taken at all stations (P-100, P-150, P-300, P-1200) and depths, two days, R/V Naše More.